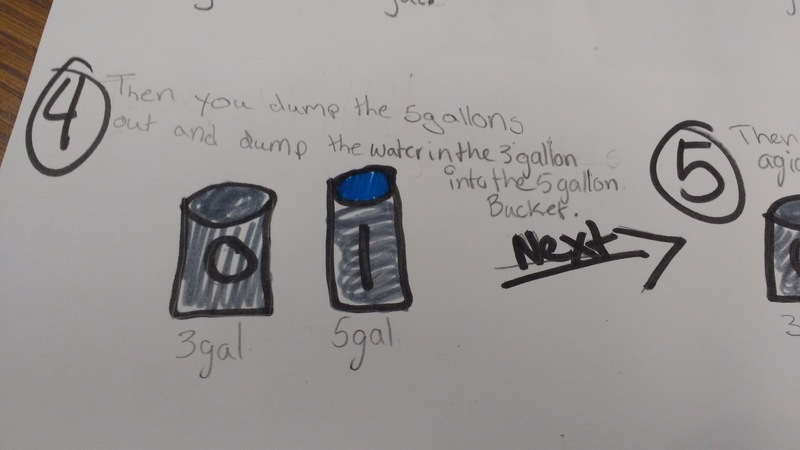 On Friday, my Algebra 1 students started to review inequalities. It was so refreshing to see them realize that this was something they had studied last year in 8th grade. 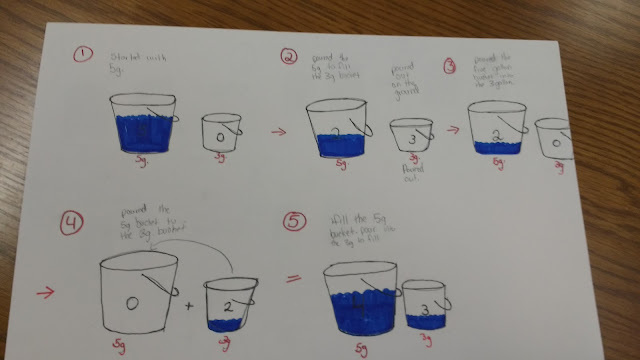 A few students mentioned that they had never figured out how to do these problems last year, and they asked lots of awesome questions. 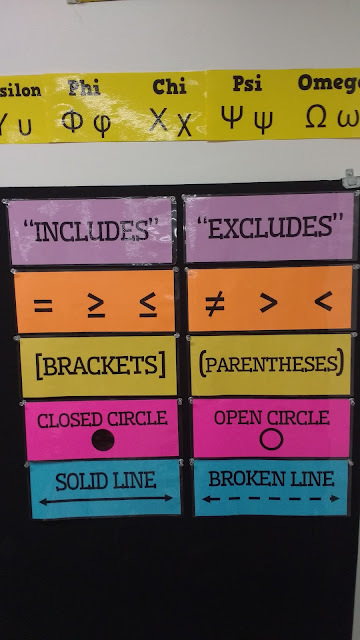 Including the "not equal to" symbol provided all of my students with a challenge since that's something they most definitely did not see in 8th grade math. Seeing light bulbs go off as they realized that we would need to shade BOTH ways was priceless! 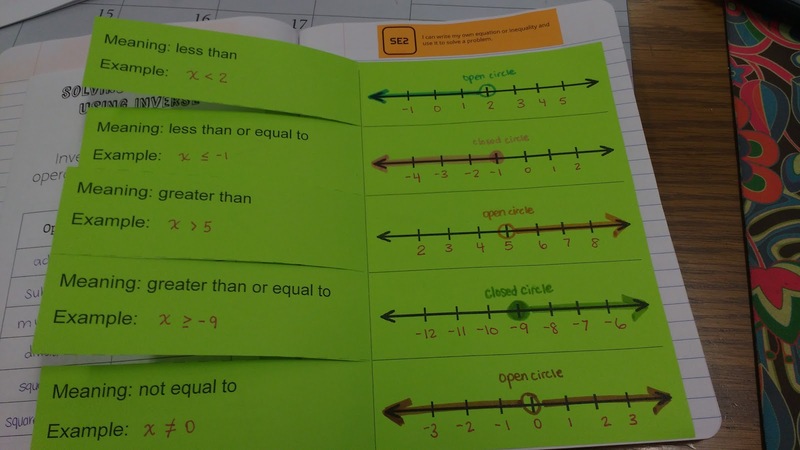 We did a quick foldable that I created and blogged about back in 2013. This is one of the few foldables that I seem to use year after year after year without editing it. 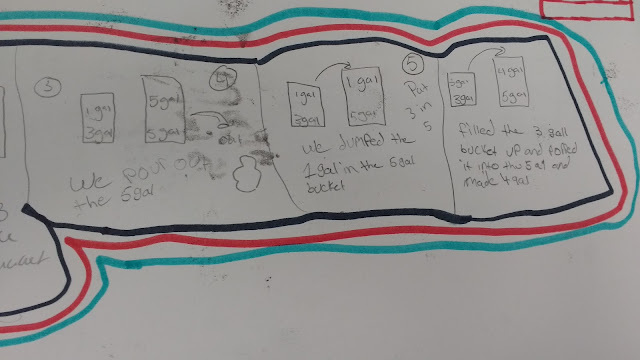 I have a different student volunteer to make an example statement for each symbol for us to graph on our number lines. 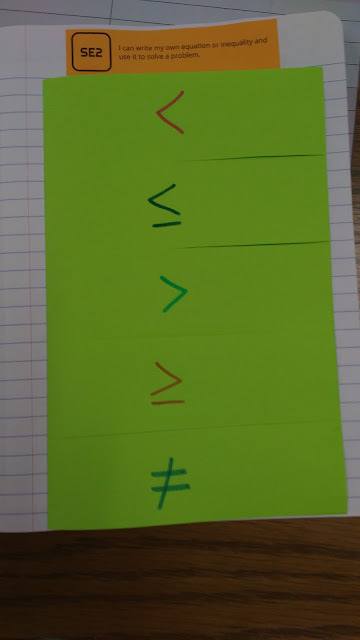 Most kiddos like to pick a variable that corresponds with the first letter of their name. 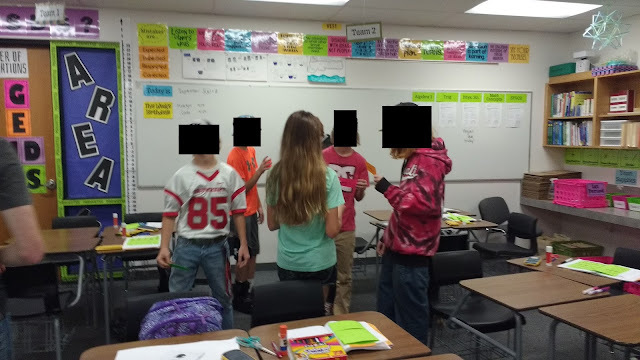 After reviewing the various inequality symbols and discussing how to graph them, we did the "Toe the Line" investigation from Discovering Algebra. I found this investigation on page 17 of this PDF. I used the snipping tool on my computer to cut out the table and paste it in a Publisher file to make an interactive notebook page. With my next two classes, I had them use their imagination to pretend there are two people walking along the number line. This worked SO much better! In both classes, one student told the class that the symbol was always going to be "less than." With each line on the table, they became more and more adamant that it was always "less than." After writing 7 less than symbols in a row, they were even more convinced. Then, we multiplied both sides of the inequality by a negative number, and there were audible gasps in the room. 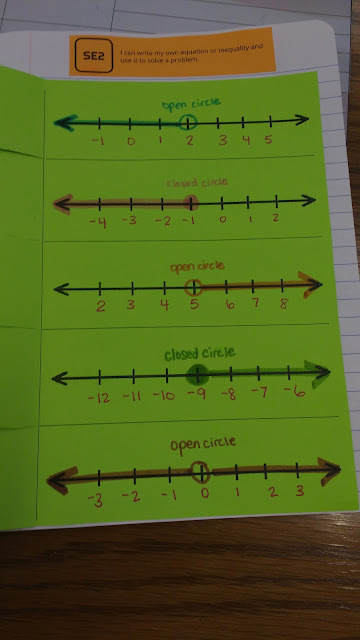 I made my students take their marker or highlighter and circle each of the steps that made the inequality symbol change. 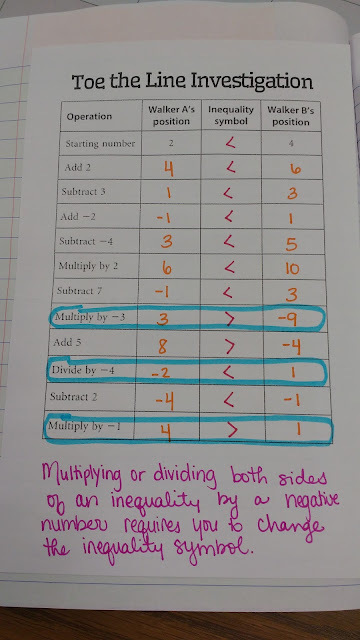 Some of my students claimed that multiplying and dividing is what changed the symbol. 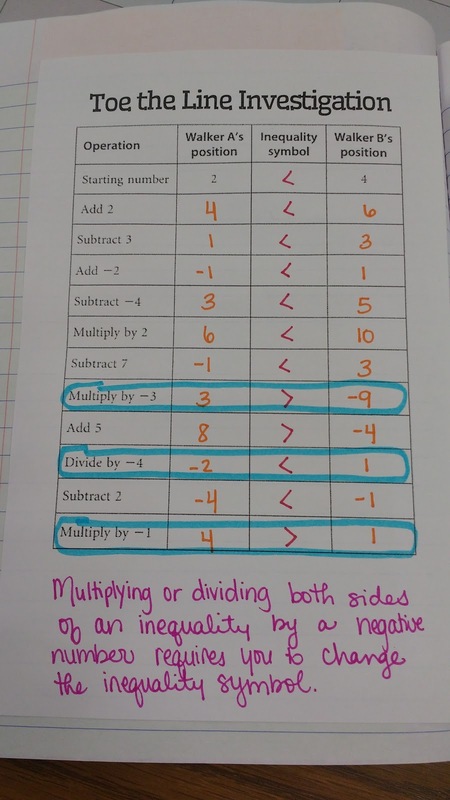 Other students recognized the need for multiplying or dividing by a NEGATIVE number. The one problem I have with this activity is that it never asked my students to divide by a positive number. This activity is a definite keeper, but I want to make my own table for next year. 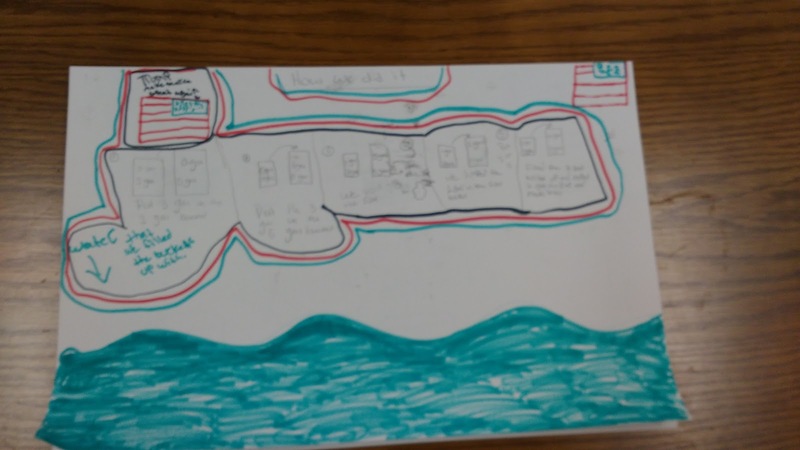 I'm disappointed that it worked better as a sit and write activity than a get up and move around activity. 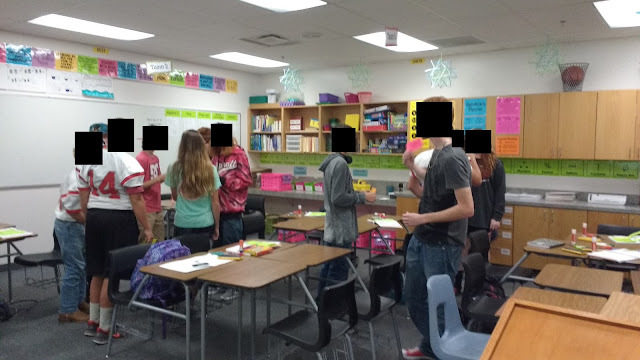 The last thing I did with my students to review inequalities was to run a quick session of "Graphs of Inequalities Speed Dating." 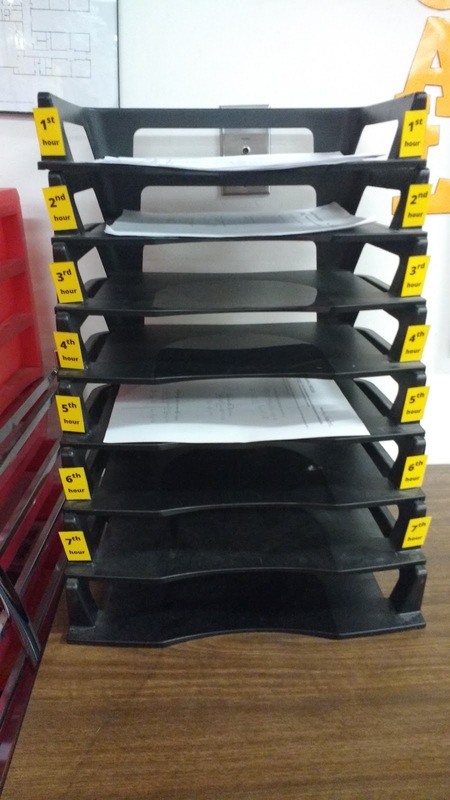 It was so hard to put these black boxes on my precious students' faces because they were all smiling. They were doing math AND enjoying it! 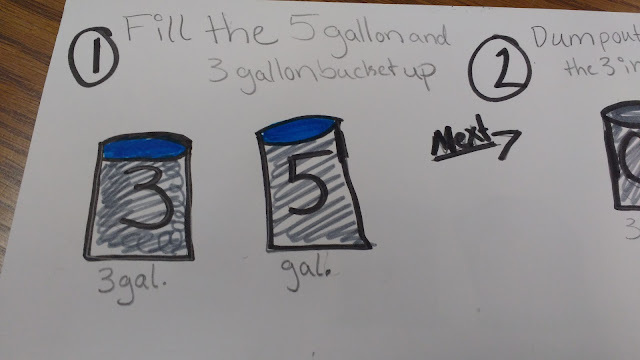 Tomorrow, we'll be starting to write our own inequalities based on story problems. It'll be interesting to see how that goes! I prepared a task card to give to my students. 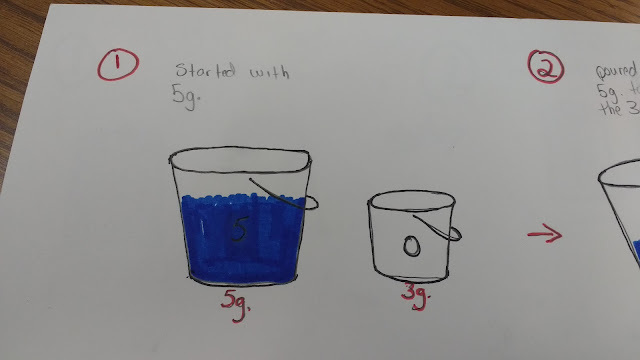 My students found this task to be a lot more confusing than I expected. Most groups read the task and wanted to declare it impossible without even attempting it. 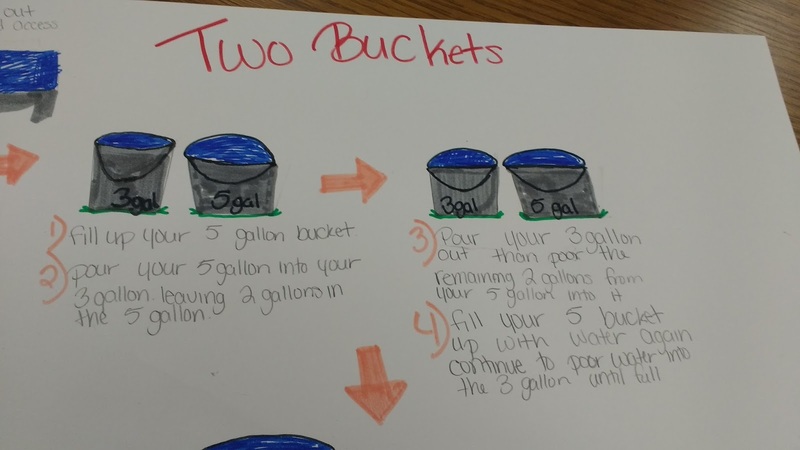 Several groups suggested that they use a one gallon jug to remove a gallon from the five gallon jug. 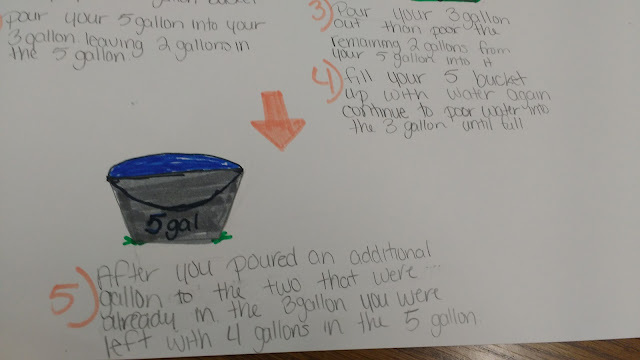 This, according to them, would leave four gallons in the jug. 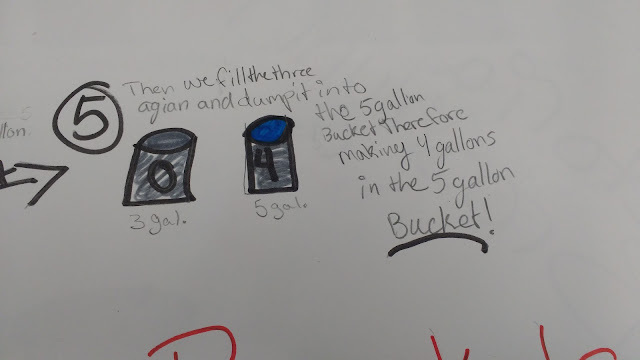 I had to remind them that they only have access to a three gallon bucket and a five gallon bucket. The other thing that students really struggled with was realizing that they couldn't just eyeball "half" of a bucket. One of my students had seen this puzzle before, so her group whizzed right through it. 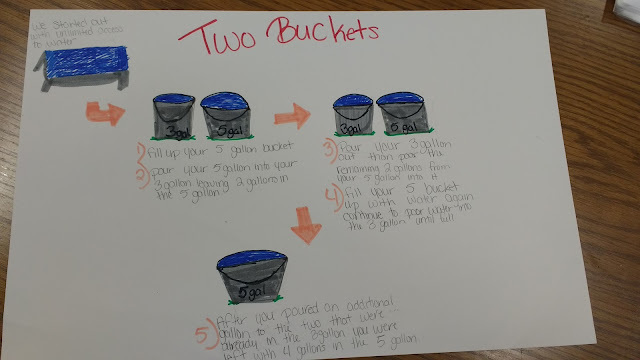 Here are the posters my groups came up with. I am a bit disappointed with the quality of the posters, but I believe that is my fault because I didn't set out clear expectations for what I wanted. I'm always learning every day. All of my groups did eventually get there, even if it did take a little prompting from me to get them started. Files for this activity can be found here. 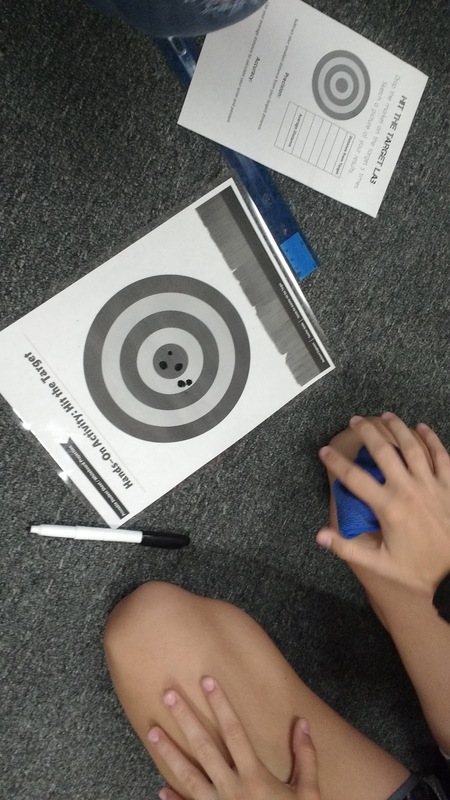 My physical science students really enjoyed this "Hit the Target" Lab. 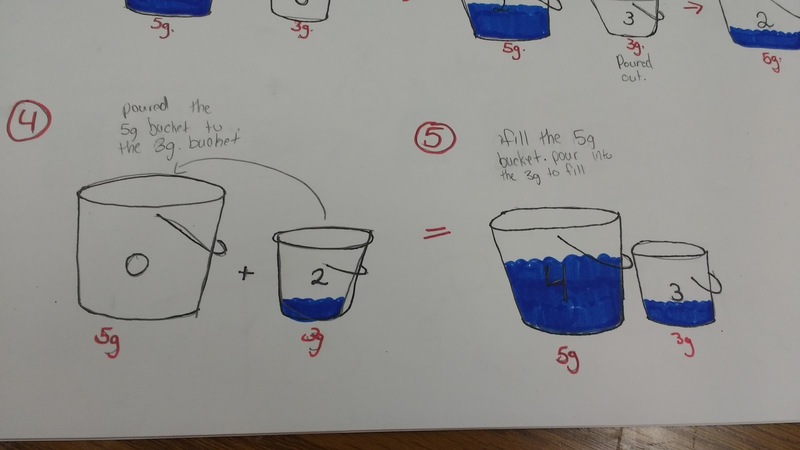 It's my first time teaching physical science, and I'm learning so much every day. When I typed up this mini-lab sheet, I thought we would be able to calculate the error and percent error. I didn't think through this very well because my students started having trouble when they went to figure their percent error. Oops. I LOVE this lab. But, it needs some major editing for next year to make it more effective. This gave me a chance to debut my new accuracy and precision posters. I've blogged about these posters here. 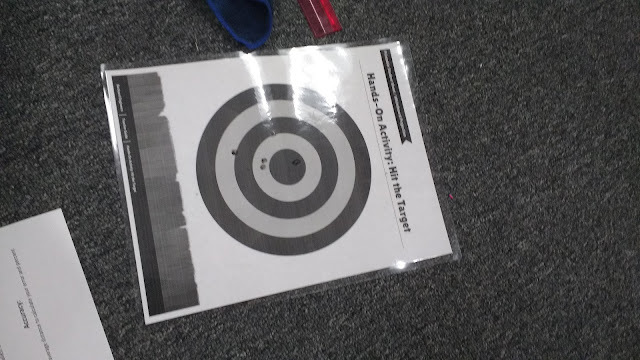 I printed off some targets from this website. The file suggested having students drop a colored marker onto the target. 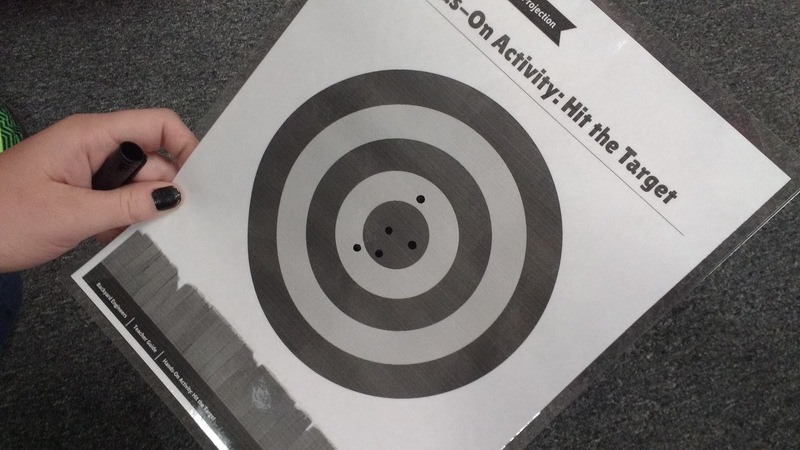 I modified this by laminating the targets using my trusty laminator. Then, my students proceeded to crouch on their knees and drop a dry erase marker on the target five times. My favorite dry erase markers to use with students are these pen style dry erase markers that are made by Universal. If you shop around and price check with other sites (I've often found them the cheapest at Shoplet or Zerbee), you can get them for around $2.00/dozen! 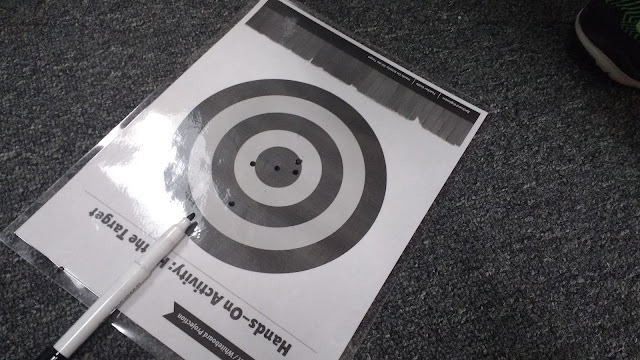 When we dropped the dry erase markers, they really did leave a dot on the target. I was a bit skeptical about this working, but it did! 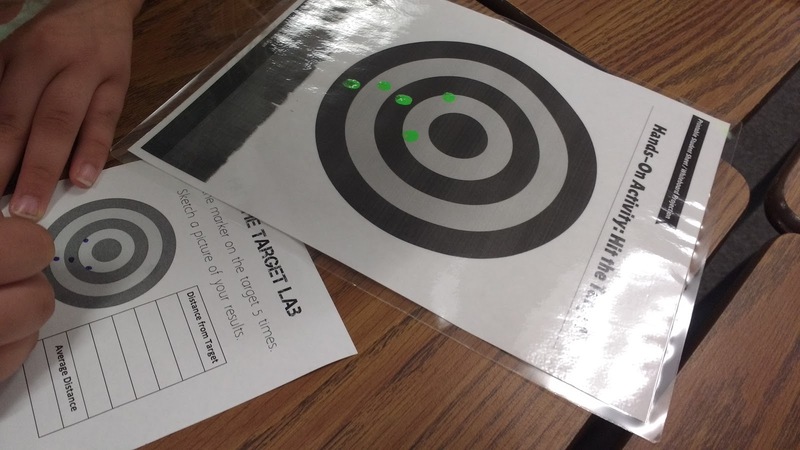 After students had dropped their marker on the targets five times, students had to sketch the dots on their mini targets for their notes. 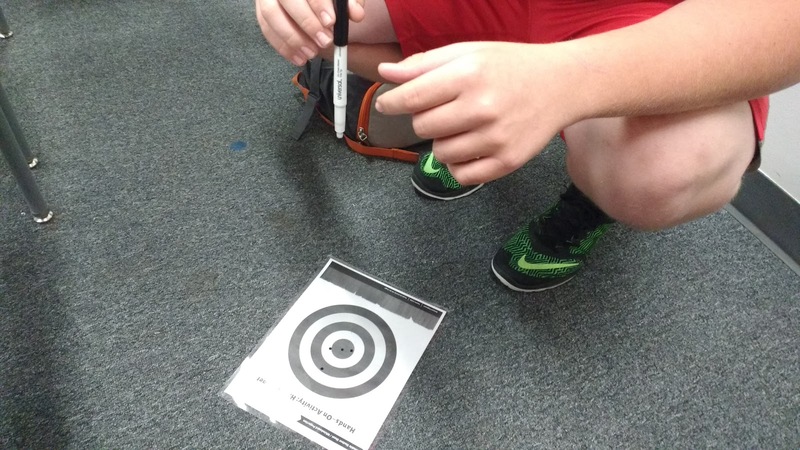 Next, students had to measure how far each point was from being in the bulls eye. This is probably the place in the lab where I messed up. I had students measure how far the point was from being in the bulls eye. So, if a student had three of their dots end up in the bulls eye, the distance for these points would be 0 mm. 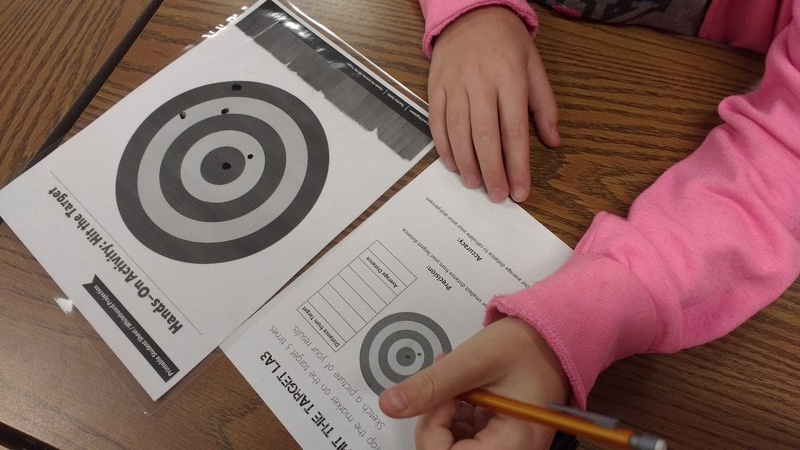 Students had to average their five distances from the bulls eye. 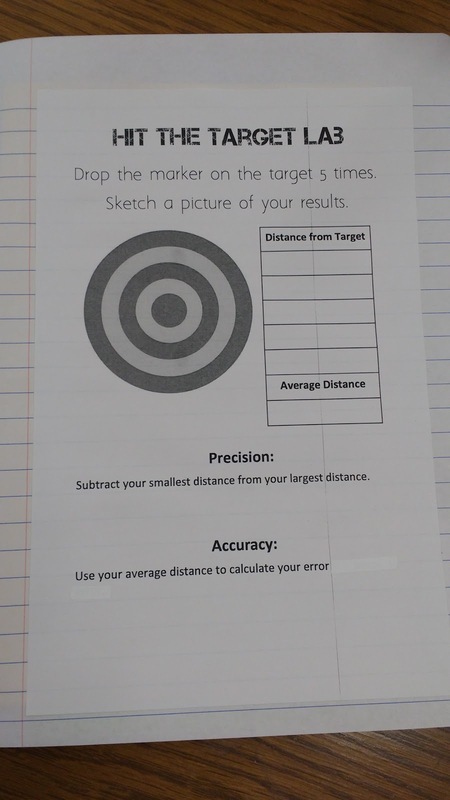 From this average, they were able to calculate their precision and their error. The problem arose when we went to calculate percent error. The actual value we were aiming for would be 0 mm, but we couldn't divide by 0 mm without getting an undefined answer. 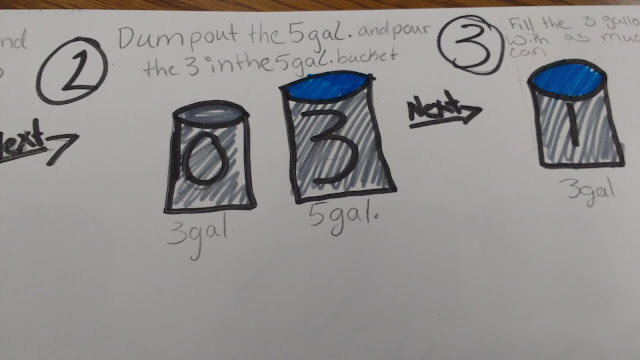 The notebook page I created for this activity can be found here. Welcome to my classroom! This is my happy place. 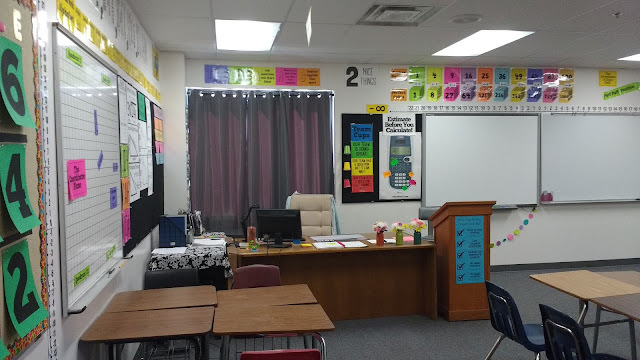 It's as bright, cheerful, and colorful as I can make it because I spend more time in this room every day than about any place else in the world. If you're not familiar with my blog, I am a high school math teacher (and occasional science teacher). 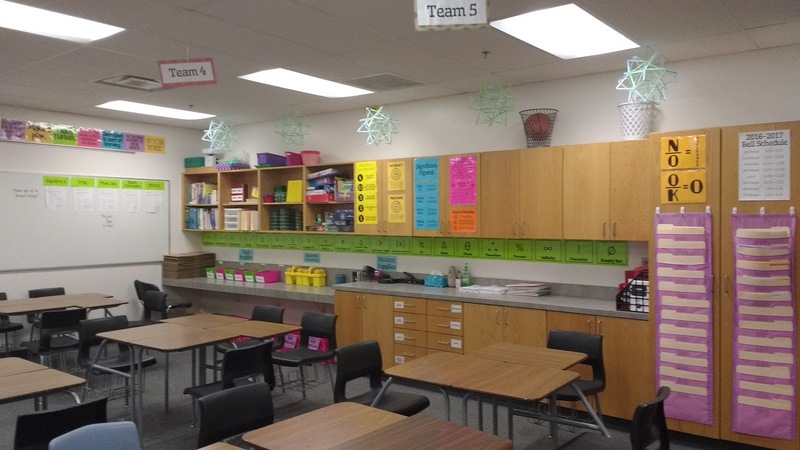 My goal is to make learning as fun as possible, and I want to make my classroom an environment that is conducive to that. Heads up - this post is LONG and full of pictures. 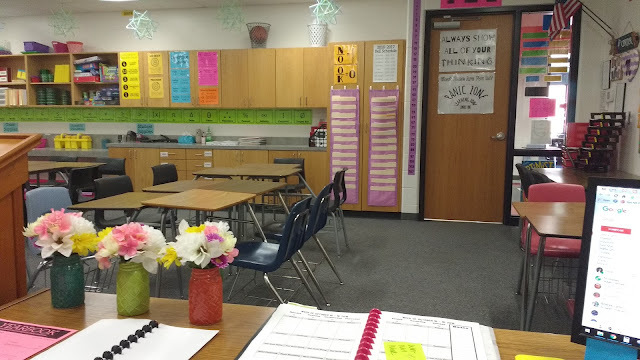 Whenever I read other blog posts where people share pictures of their classroom, I'm always left wanting more. I want to see every single thing hung on the wall. I guess you could call me nosy. ;) So, I set out to write the blog post I would want to read. I've tried my hardest to provide links to the blog posts that have the files to make the many posters I have created. We'll start out with an overview and finish with specifics. Here's the view from my desk towards the door that students enter from. 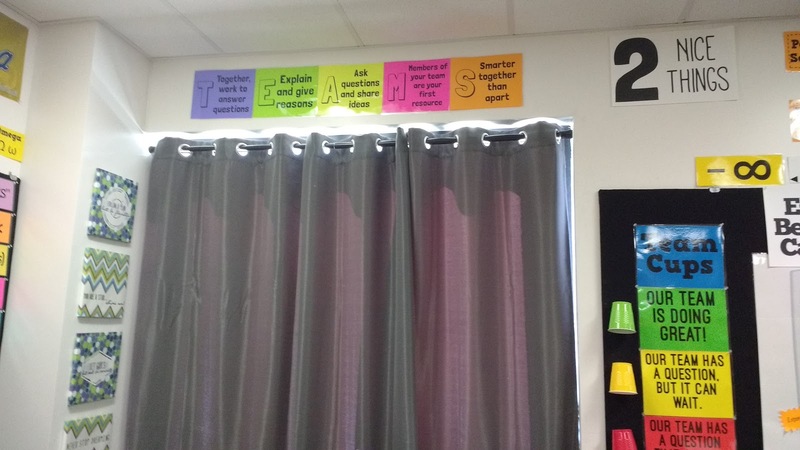 This is the view from my desk towards the door that connects my classroom to another classroom. When this school was built, this was intended to be a math classroom. The adjoining classroom is a computer lab that was built to be a "math lab." Since my school has combined the high school and middle school into a single building, space is at a premium. Therefore, the "math lab" has been transitioned to a middle school English classroom. This picture shows the back of my classroom. This is the same wall that has the door that opens to the hallway. This picture shows the entire wall that contains the door to the math lab. 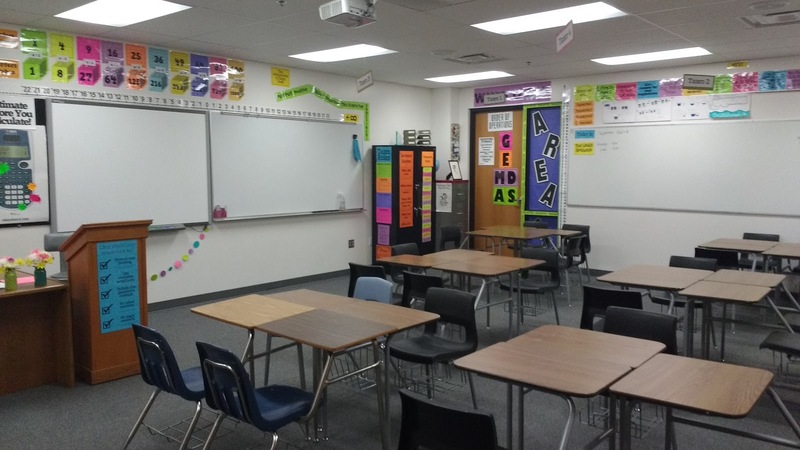 Next, we have a view of the front of the classroom from the door. Here's another view from the door that shows my desk and the huge window behind it. This window lets in SO much light that I couldn't read my computer screen. I was able to find some blackout curtains at Tuesday Morning that help control the light coming into my room. Now, I want to show you some close-up details so you have a bit more of an idea how things function in my room. I bought this pink cart (link to same cart in different colors) at a yard sale a few years ago for $5. Yes, the shelves are a bit crooked. It's welded together at an angle. I didn't notice that before I bought it, but I think I would have still bought it for $5. The top shelf holds notebook paper. 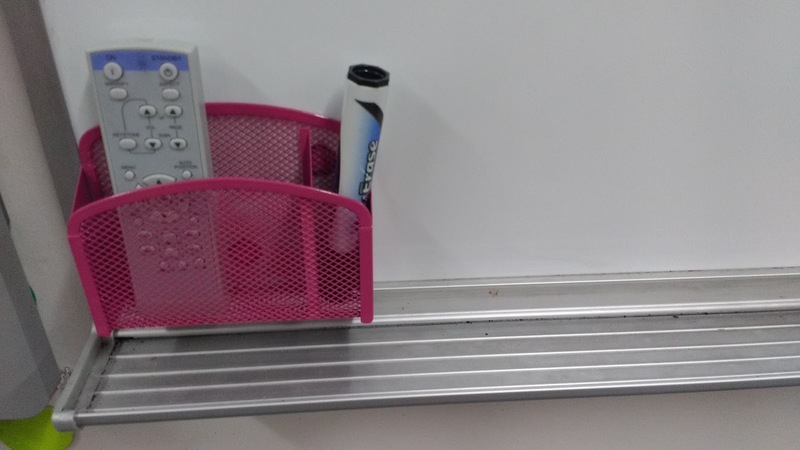 The second shelf holds graph paper. The third shelf holds origami paper (link to my favorite origami paper to use with students). The next shelf has some old interactive notebook table of contents templates that I haven't used for a few years now. The shelf below that has blank frayer models inside. The rest of the drawers have random stuff in them at the moment. I haven't figured out a use for the rest of them. 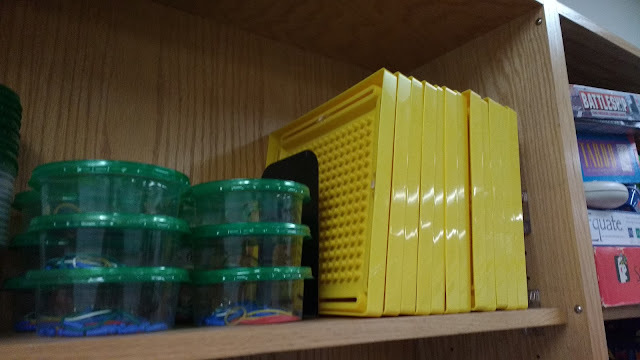 Now that my classroom has more built-in storage, I'm starting to wonder if I still need this cart. Right by the door, you'll find my American flag and Oklahoma flag. At my old school,we said the pledge to the American flag each morning. At my new school, we say the pledge to the American flag AND the Oklahoma flag each morning. As someone who hasn't said the pledge to the Oklahoma flag since 6th grade, this has taken some getting used to. 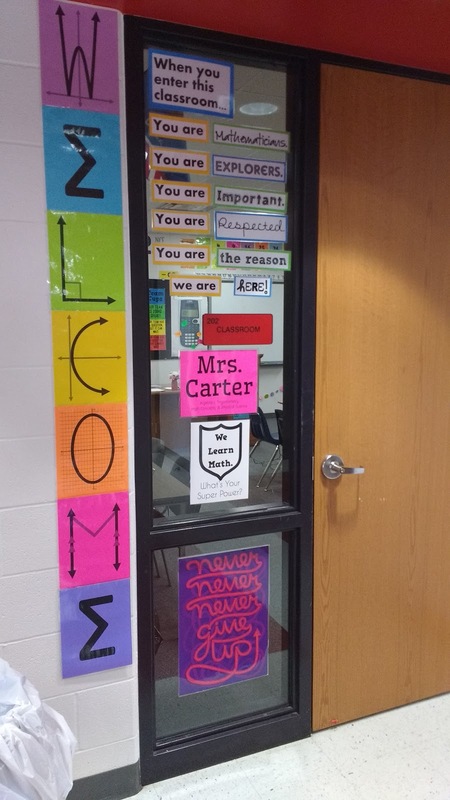 Next to the flags, I hung my new "Mrs. Carter" sign that was a gift from a coworker at the end of last year. 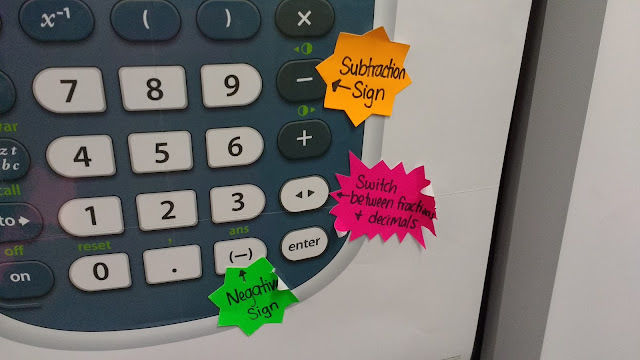 The "Math = Love" sign was made for me by a different coworker. My lovely sister made the glittered pi sign for me to decorate my classroom with. 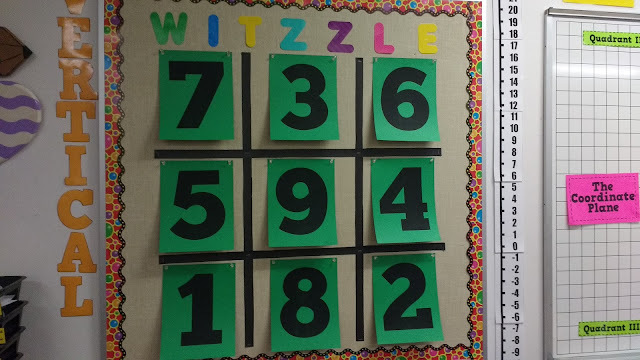 This Witzzle bulletin board was the only bulletin board in my classroom when I was given the keys to it. 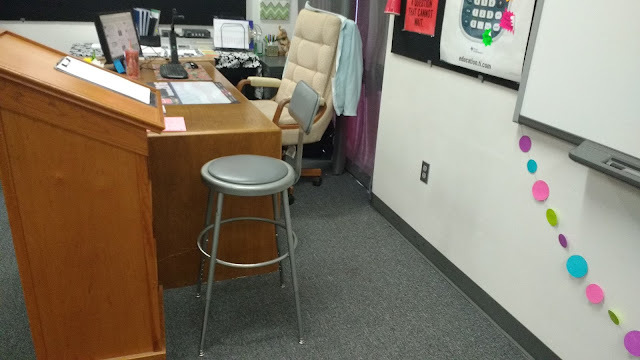 The other bulletin boards were moved over from my old classroom. When I got my first ever classroom, my parents helped make me bulletin boards to cover the old chalkboards in my classroom. 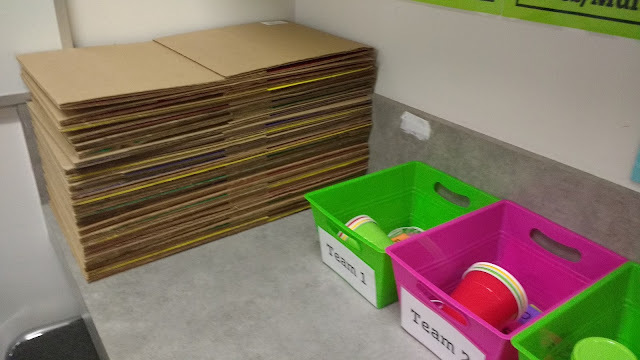 I was so excited that they offered to help move them to my new classroom. Witzzle is a card game. 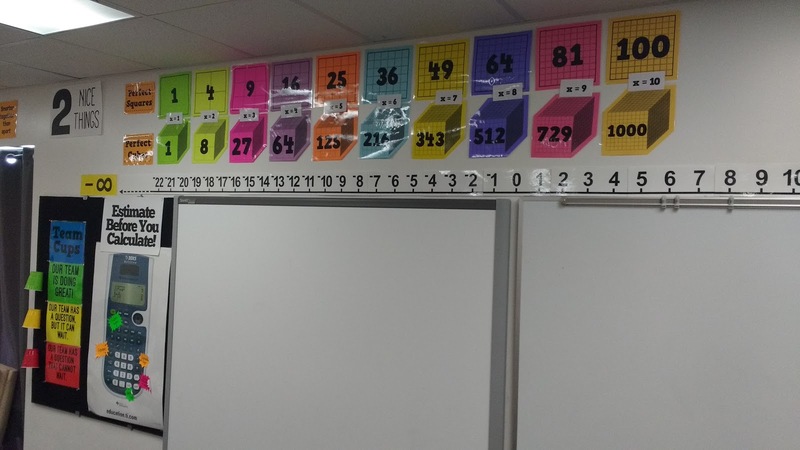 Each card features the numbers 1-9 arranged in such a way that you can use the numbers in any row, column, or diagonal to make every number between -12 and 36 by adding, subtracting, multiplying, or dividing. You can change the order of the numbers in the row, column, or diagonal. For example, you could arrive at 20 by doing (9-5)*4 or 8 + 9 + 3. The game is out of print as far as I can tell, but that has never stopped me from playing. I only recently was able to find a used copy of the game on ebay. In the past, I have projected a set of numbers on my SMARTBoard. 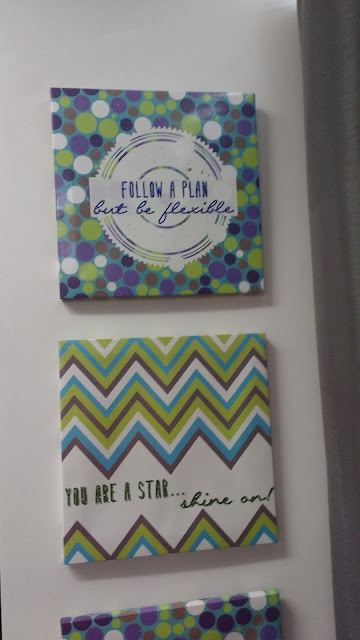 This year, I decided to make it into a bulletin board. This game is the perfect way to use up those last 3 or 4 minutes of class when students get done with things earlier than you expected. I just call out a number. The first student to figure out how to make that number yells "Witzzle!" and share the correct solution gets a piece of candy. 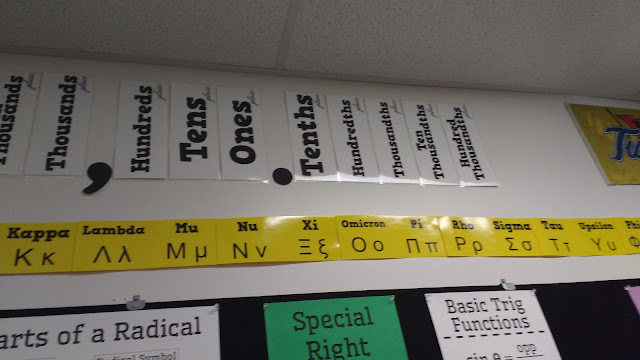 The numbers are hole punched and hung on thumb tacks so that the numbers can be easily rearranged to form a new set of numbers. I've blogged more about Witzzle here. 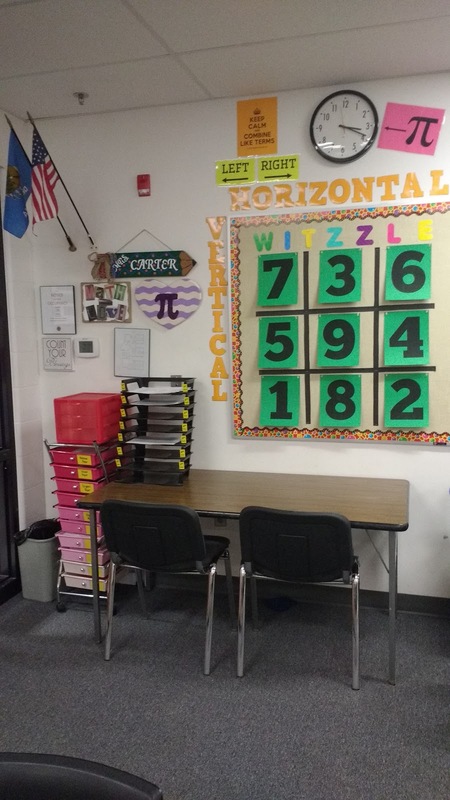 Around the Witzzle bulletin board, I have letters hung that spell "VERTICAL" and "HORIZONTAL." 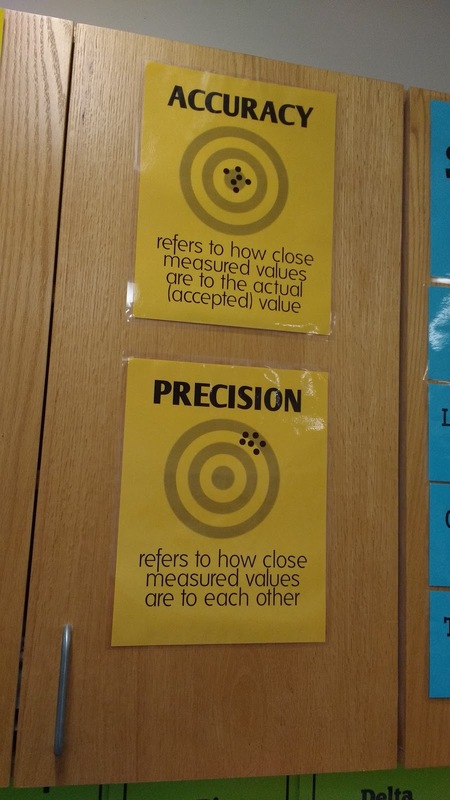 Many of my students confuse these two terms, so I put this as a visual reminder to them. 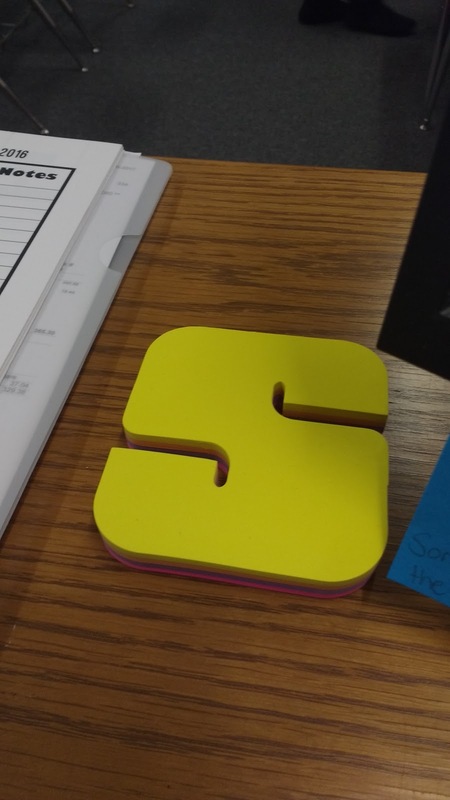 These letters get used a lot! I blogged more about these letters (and shared the file to make them) here. 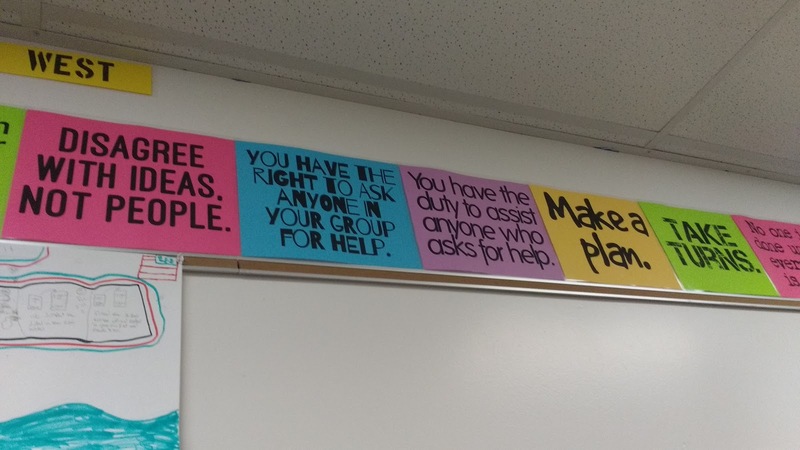 Above the horizontal lettering, I have my left/right reminder signs. I've uploaded the files for them here. And, above those signs, I've hung my "Keep Calm and Combine Like Terms" poster. You can find the file for that poster here. 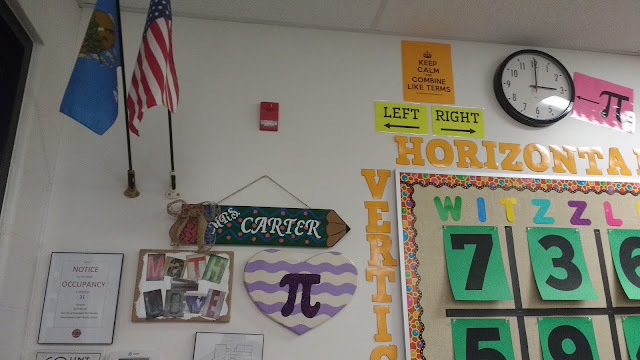 Pointing to approximately 3.14 on my clock is my pi poster. I blogged about this idea that I stole from Annie Forest here. 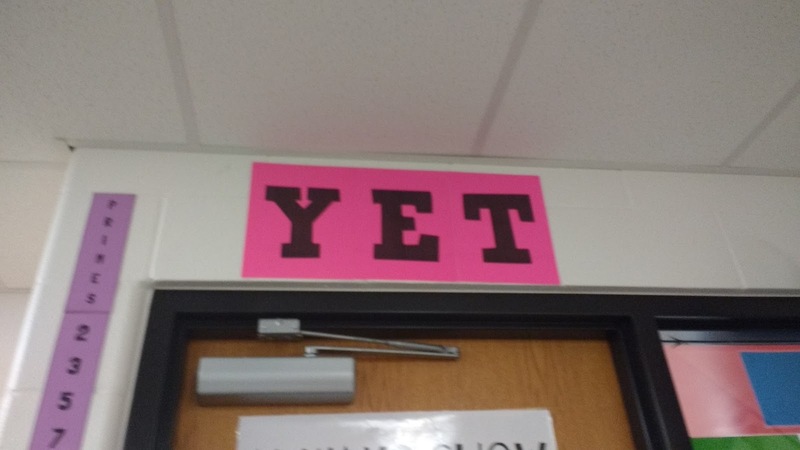 Above the door, I have a "YET" poster. 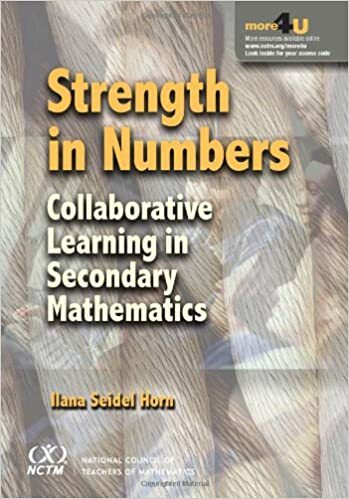 This poster was inspired by Ilana Horn's Strength In Numbers book. It ties into my desire to help my students develop a growth mindset. When students say they can't do something, I want them to change that to "I can't do that YET." 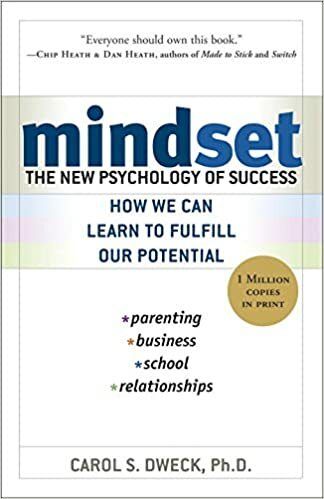 If you're looking for more information on growth mindset, I can't recommend Carol Dweck's Mindset book enough! The door to my classroom currently hosts two posters. 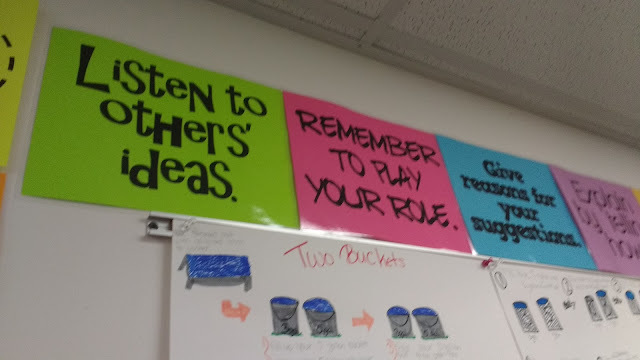 These posters were printed at Staples as an engineering print. Engineering prints are super cheap, but they are printed on super thin paper. I laminated them to make them more durable and make up for the thin paper. 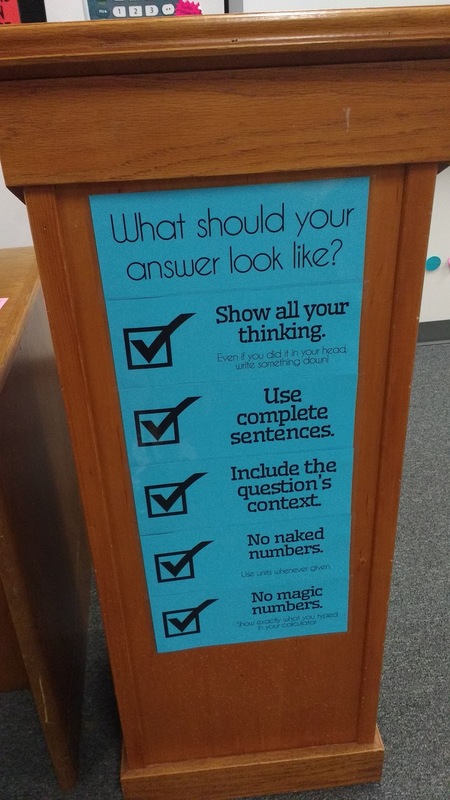 You can find the file for the "Always Show All Of Your Thinking" poster here. 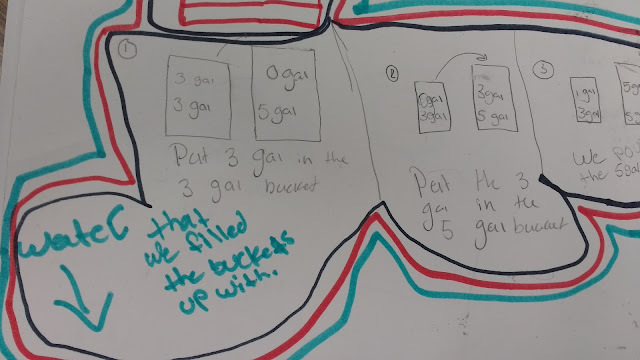 I try to ask students to show all of their thinking instead of asking them to show their work. It's just a slight change in wording, but I find it can make all the difference. 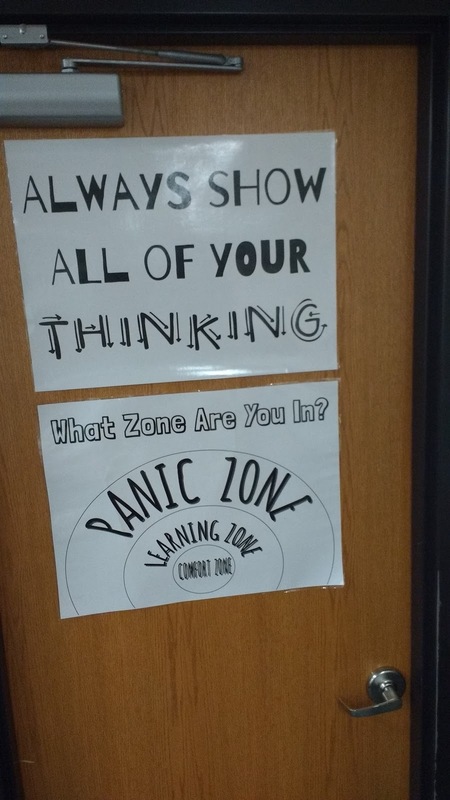 And, the "What Zone Are You In?" poster file is uploaded here. Stepping back from the door shows that I hung my prime number posters vertically beside the door. These get referenced all the time by my trig students. 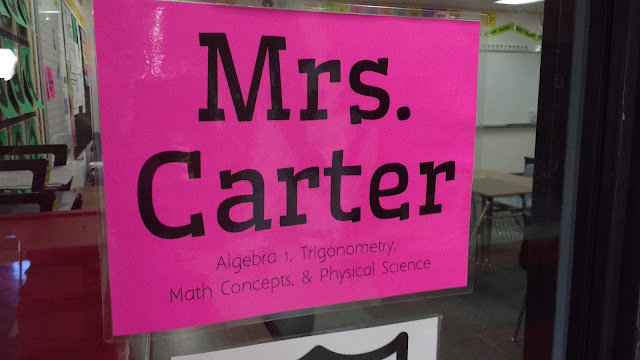 When I was teaching Algebra 2, they were super popular, too. 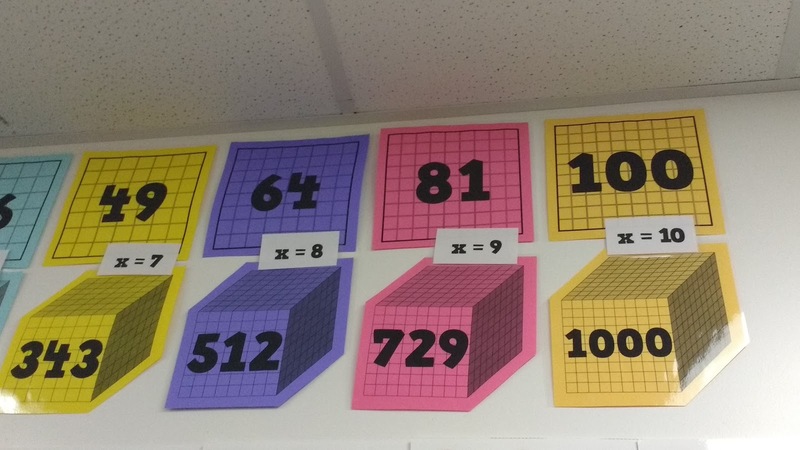 My Algebra 1 students have been largely ignoring them so far. Wait until we get to our unit on radicals, though... 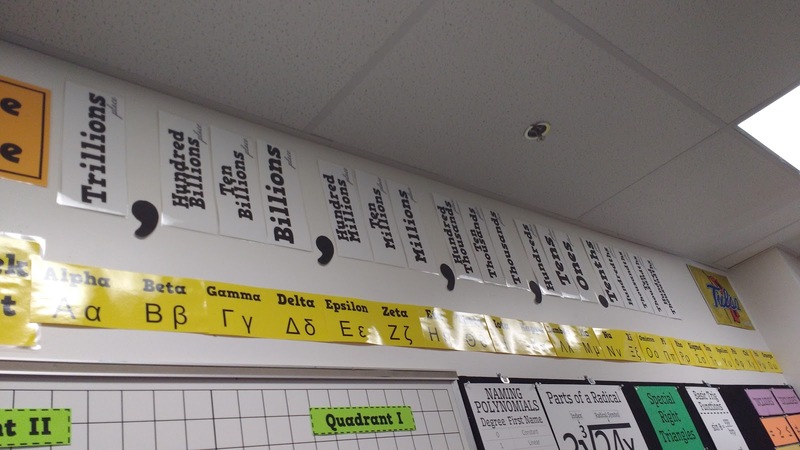 I blogged about these prime number posters here. Here's a close-up of the poster in the lower right hand corner. 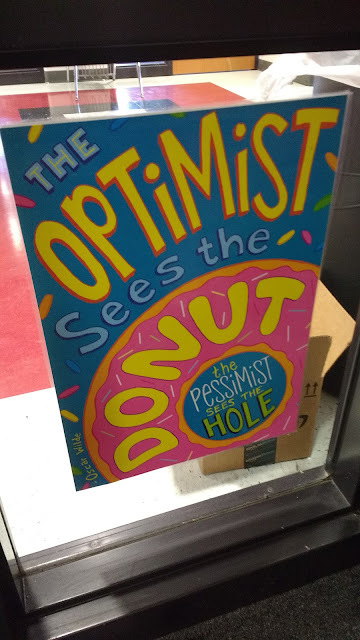 I love this quote: "The optimist seems the donut. The pessimist sees the hole." You can purchase this poster here. I LOVE that my new classroom has an entire wall of cabinets. 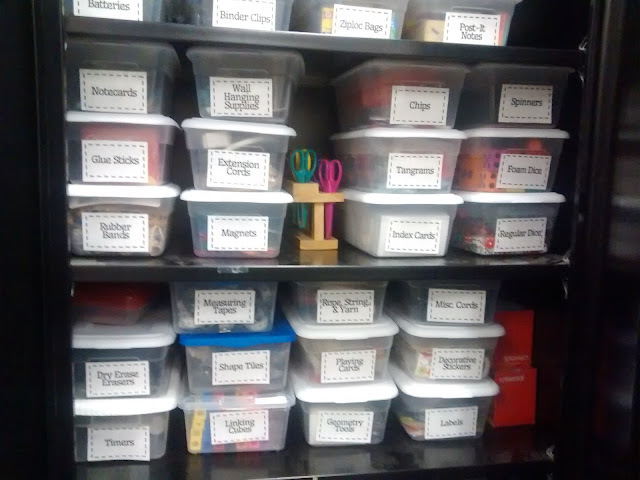 I have two full length cabinets that have come in handy for storing all sorts of odd-shaped things on my classroom. 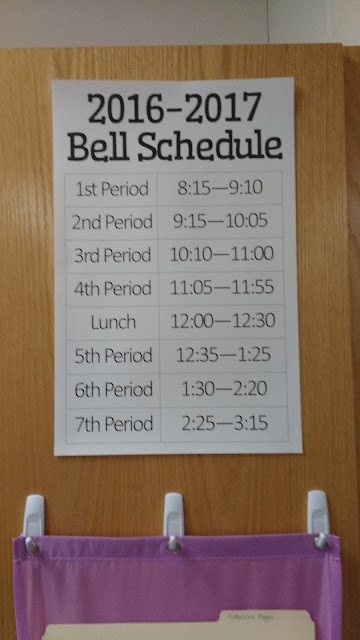 We got a new bell schedule this year that actually has the bells ringing on multiples of five! For the past two years, our bells have rang at random times like 10:57, and it's been impossible to remember what times classes start and end. The file for this poster is uploaded here. The font is Wellfleet. 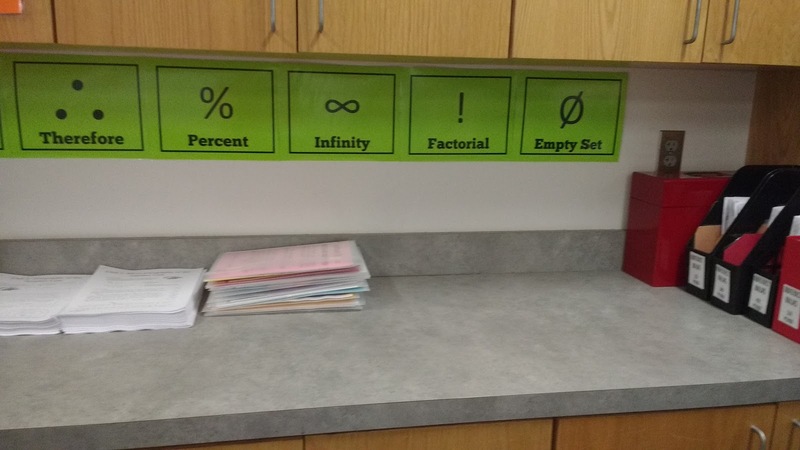 The next cabinet door has my posters that remind students what to do when 0 appears in their fraction. 0 in the denominator is a big NO NO. That results in an undefined answer. 0 in the numerator is OK. It just means the answer is zero. You can find the files for these posters here. Beneath these posters, I have two purple filetastics (find a similar file system by Scholastic here) that I bought from Mardel. I bought a set of Command hooks to hold up the filetastics. So far, they have held them up really well. Each folder holds extra copies of notebook pages for my students, sorted by unit. 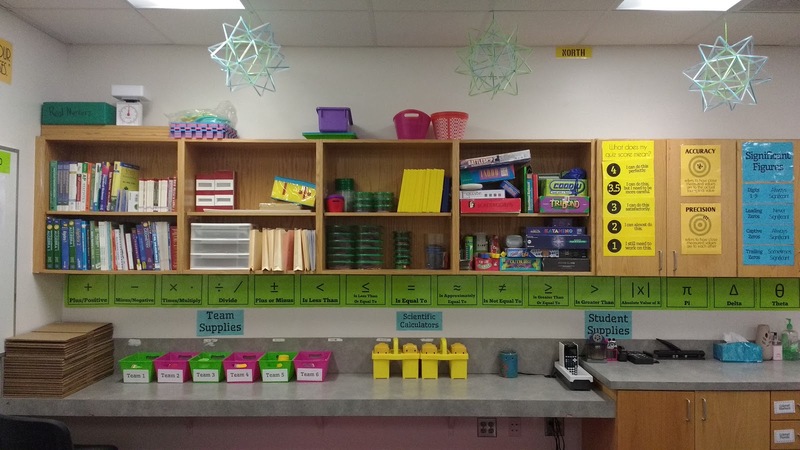 The next few pictures are taken from the back counter in my classroom. 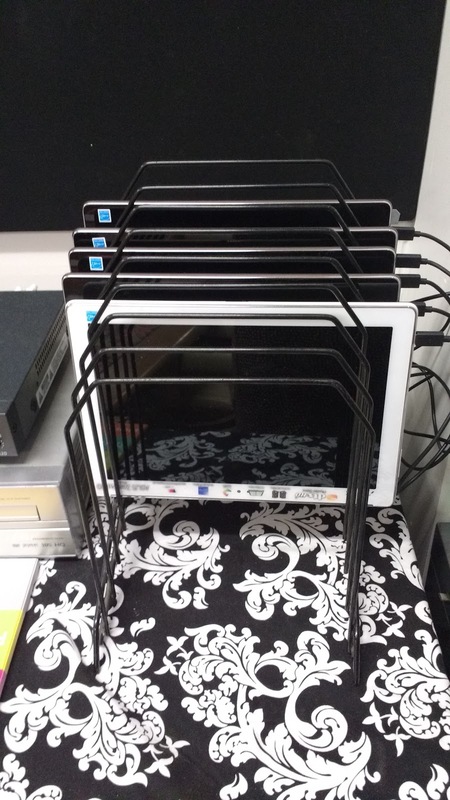 I have a set of mismatched magazine holders that hold the numeracy ninja books for each of my math classes. 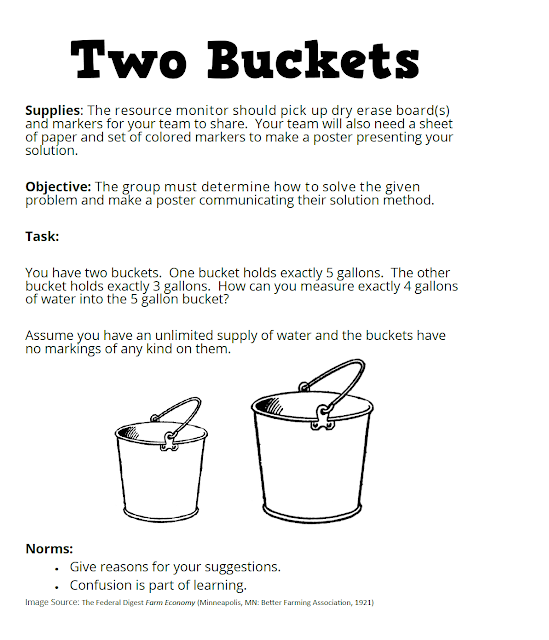 You can find out more about this free numeracy building resource here. 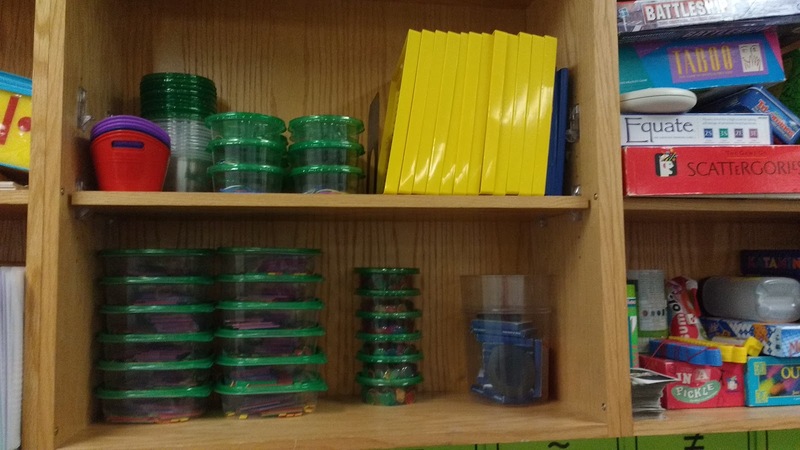 My big focus for this year is to build my students' numeracy/mental math skills. I am taking two big steps toward this. On Mondays-Thursdays, we are doing either a number talk or a problem string that requires students to do mental math problem(s). 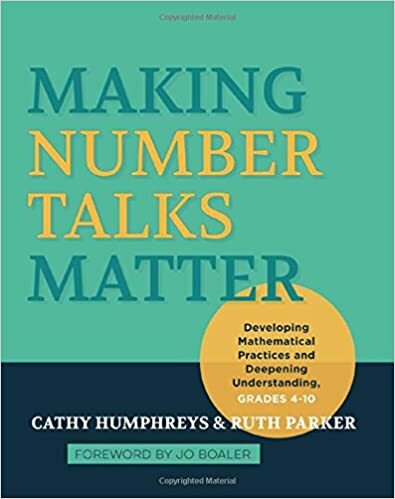 I learned about number talks by reading Making Number Talks Matter. 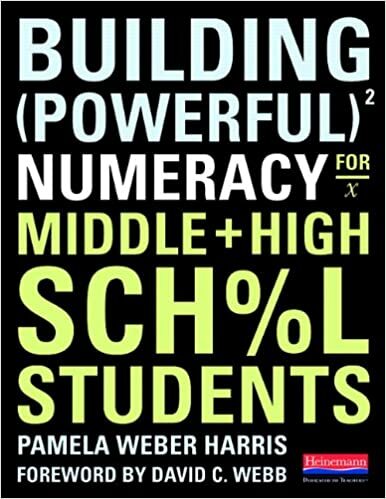 I'm currently reading about problem strings in Building Powerful Numeracy for Middle and High School Students. Reading these two books has really been a life-changing experience for me. In school, I relied primarily on the traditional algorithm for solving addition, subtraction, multiplication, and division problems. My mental math skills are okay, but they have a lot of room to grow. These two books opened my eyes to many new methods of solving these problems that I had never considered before. On Fridays, my students take a five minute numeracy ninja test. This helps my students measure how their mental math skills are growing. 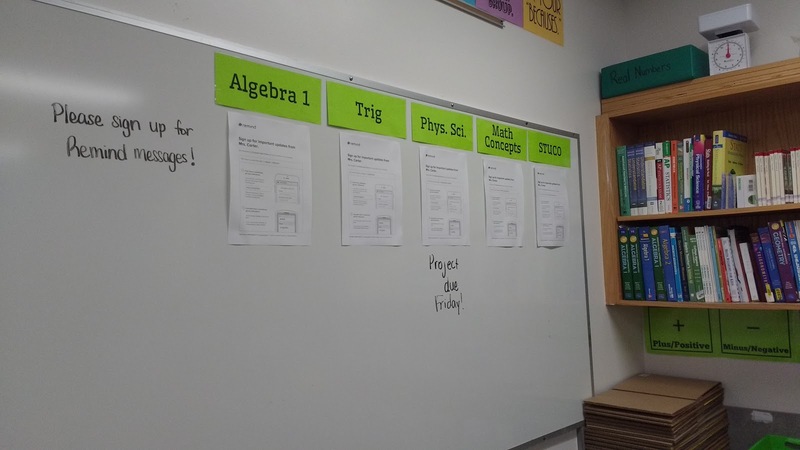 It also provides a review of key concepts needed in upper level math. I put the supplies that students use the most in these drawers. To help my students (and me!) 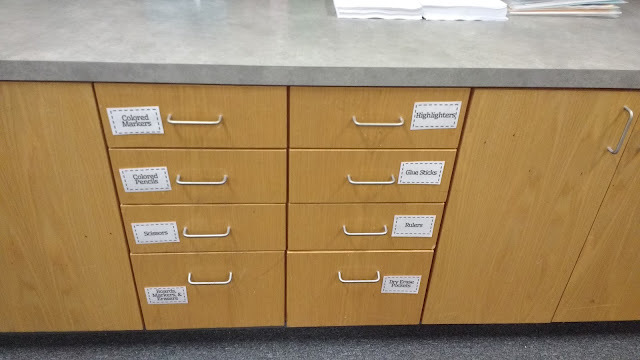 remember what is in each drawer, I created a small label to tape to each drawer. 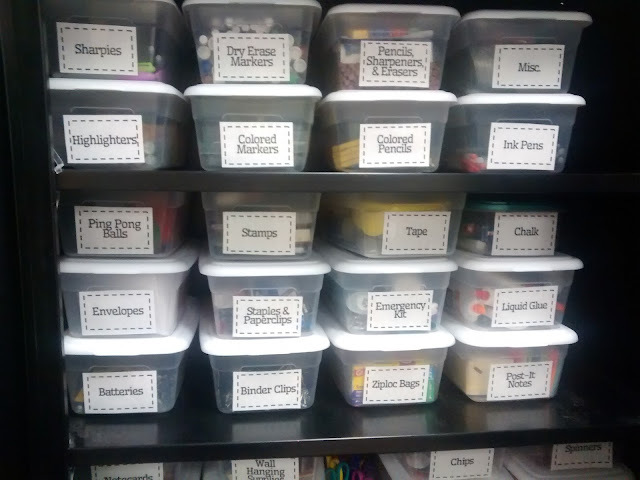 These drawers hold colored markers, highlighters, colored pencils, glue sticks, rulers, scissors, dry erase boards, dry erase markers, dry erase erasers, and dry erase pockets. For dry erase pockets, I recommend purchasing "shop ticket holders" from Amazon. They are super cheap, and they allow you to change any activity into a reusable dry erase activity. My favorite dry erase markers to use with students are these pen style dry erase markers that are made by Universal. If you shop around and price check with other sites (I've often found them the cheapest at Shoplet or Zerbee), you can get them for around $2.00/dozen! On the counter top, I also have a section for student supplies. This is the tape dispenser, stapler, hole punch, and pencil sharpener I expect my students to use. 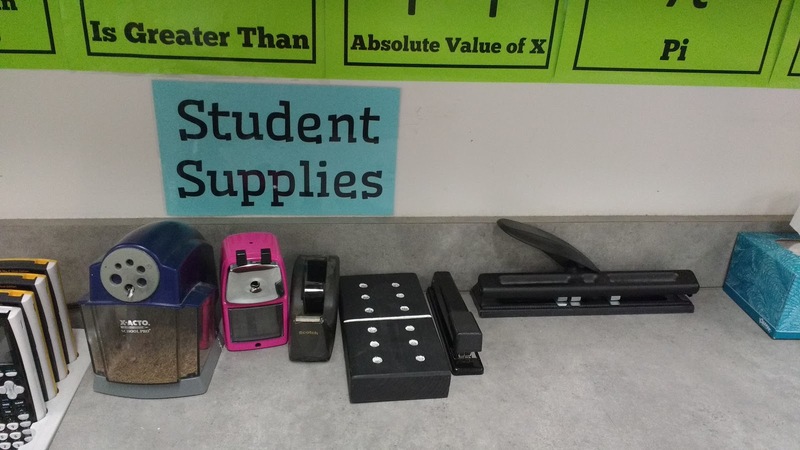 I don't want them coming to my desk to looking for these supplies. This is also where I keep my Kleenex box, hand sanitizer, lotion, and Glade air freshener. 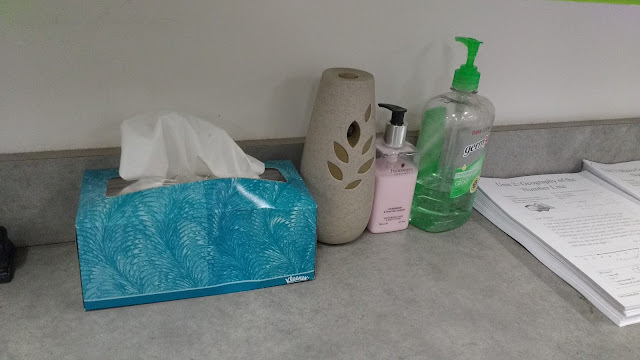 My students are always complaining that the classroom smells. Having this air freshener go off every 36 or so minutes keeps my room smelling much fresher than it has in the past! I turn off the air freshener when we're not there to make it last longer. Right now, I'm using the "Cashmere Woods" scent. My classroom set of TI-30XS scientific calculators also finds its home on the counter. 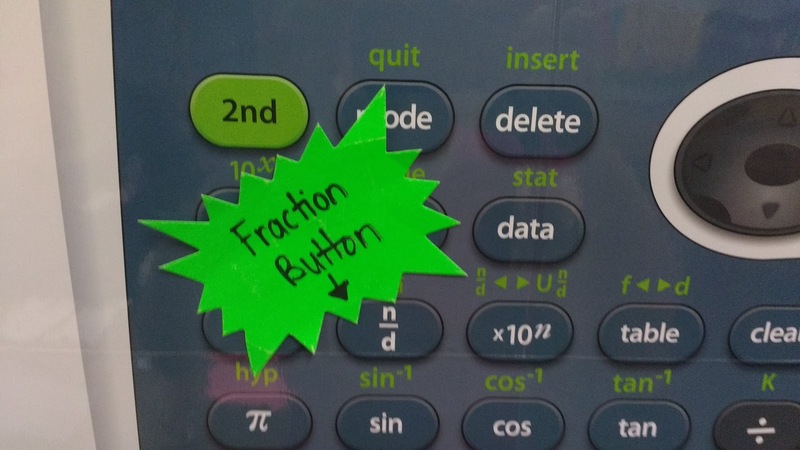 I LOVE these calculators because they have an awesome fraction button that makes life so much easier! You can also see my scentsy pot in the corner, but it's not currently in use because my extra wax is currently MIA. Here are my team tubs. 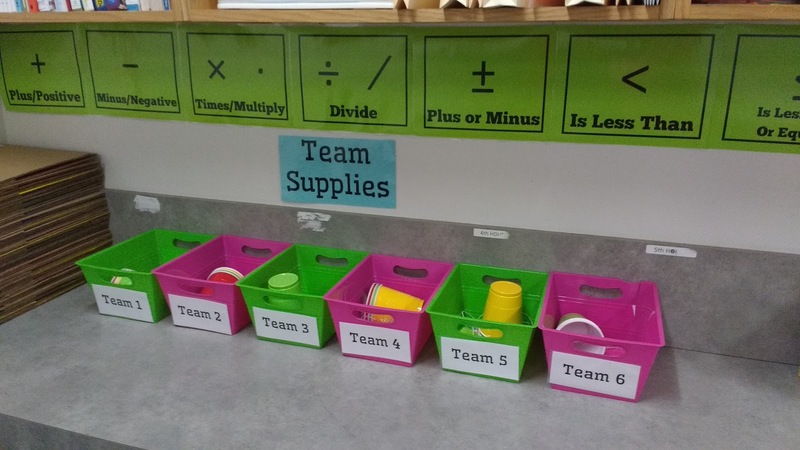 Each tub has red/yellow/green cups for group work. These tubs also contain my group work role badges. From this picture, you can see my messy supply shelves. These still aren't as organized as I would like. You can also see my math symbol posters that live right underneath the cabinets. 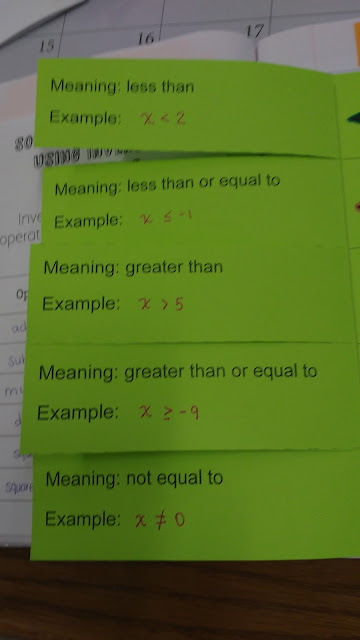 These are especially referenced by students when trying to remember whether < stands for greater than or less than. I've blogged about these posters here. Since I'm running out of space for posters on my walls, I've turned to hanging posters on my cabinets on the back wall. These posters explain the meaning of various SBG scores. My husband wrote the skill level descriptors. I just made them into a pretty set of posters. You can find the files for these posters here. 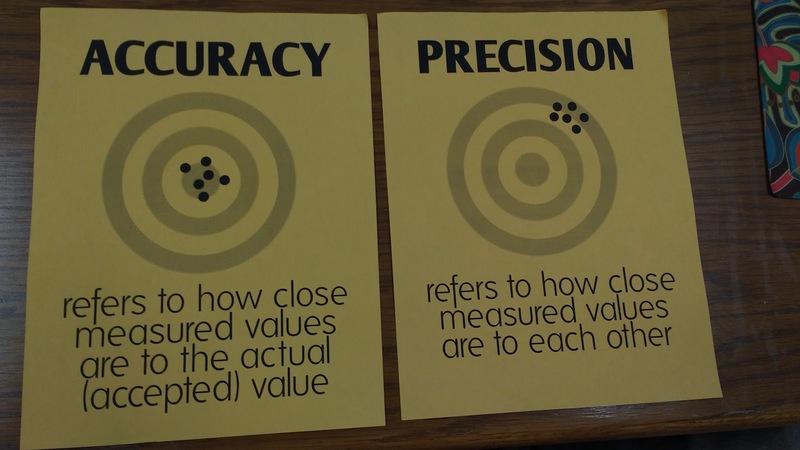 I made these posters to remind my physical science students about the difference between accuracy and precision. Files for these posters are uploaded here. 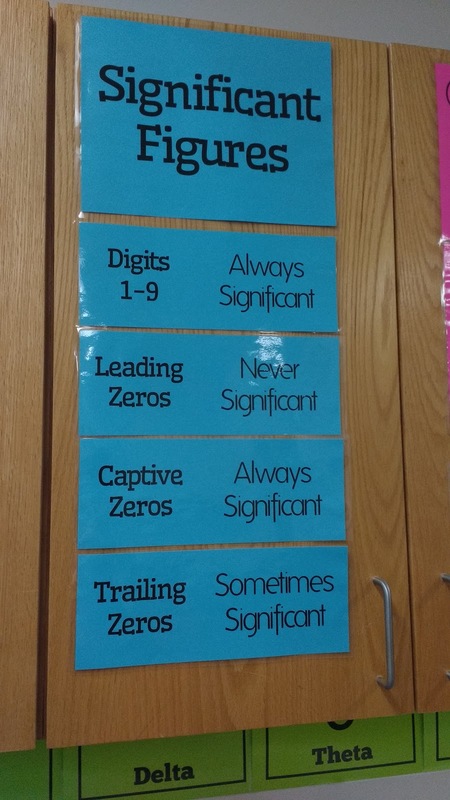 The next few sets of posters review the rules for significant figures. 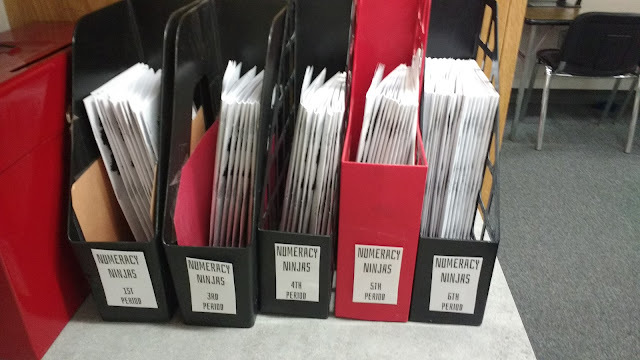 I also made these for my physical science students. This is my first time teaching physical science (or any science for that matter), and I am not trained in teaching science. So, I'm learning right along with my students. I need these poster reminders as much as they do! You can find the files for these posters here. Beneath the counter, I have a milk crate for each of my class periods. 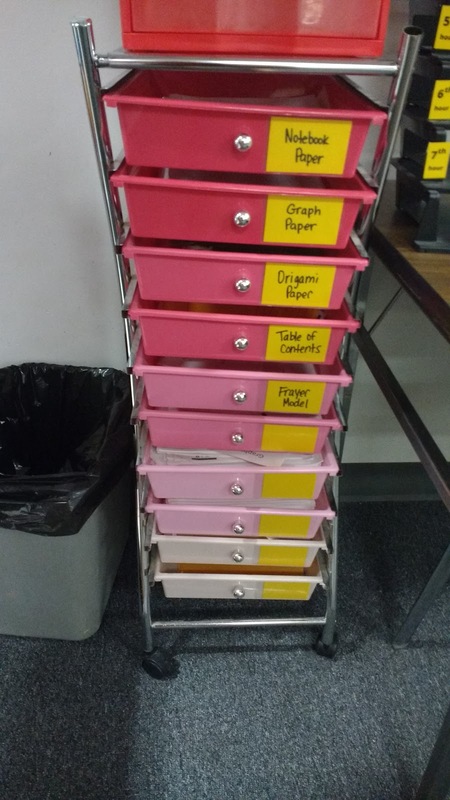 This crate allows students to keep their notebooks and folders in my classroom. The file for the crate labels can be found here. My only complaint about these crates is that students keep picking up the crates, setting them on the counter, and leaving them. 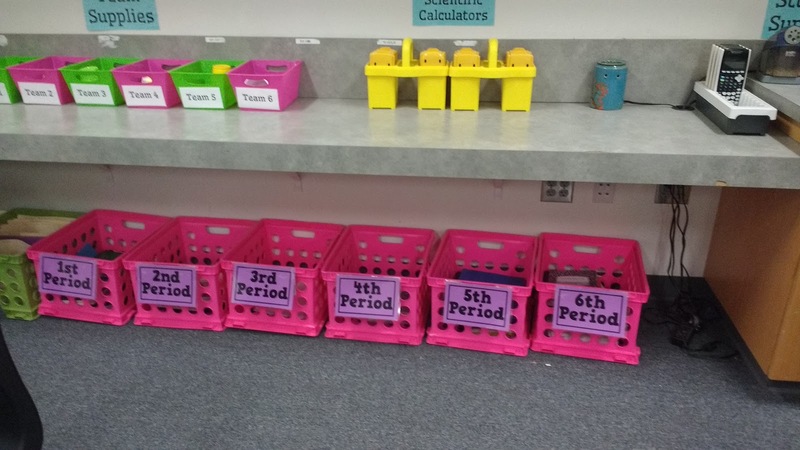 At the end of today, three different period crates were sitting on the counter instead of the floor. In the corner, I have a stack of dividers that allow students privacy while taking a quiz or playing a game that requires hiding your pieces. These were in the math lab next door, and I asked the teacher who took over that classroom to borrow them. 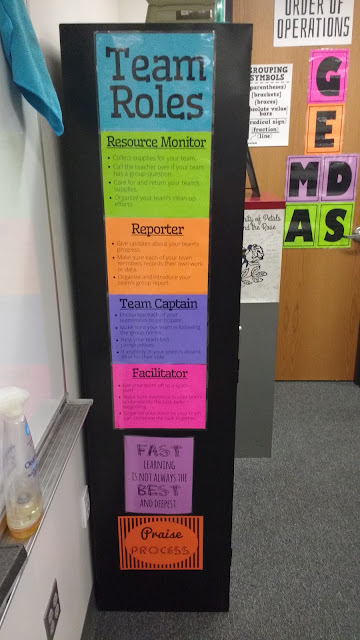 These came in very handy when we did the Rainbow Logic activity from Designing Groupwork by Elizabeth G Cohen during the first week of school. Here's a peek to show you what you'll find on my shelves. 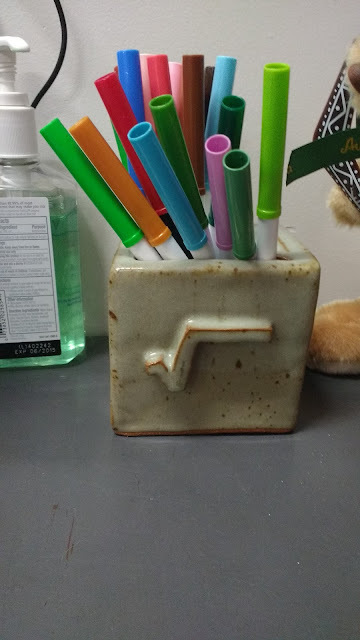 These bowls (multi-packs from Dollar Tree) hold algebra tiles. I put two sets of algebra tiles in each bowl so that each pair can grab a bowl and get started. These bowls (also from Dollar Tree - 5 for a dollar!) hold bingo chips. 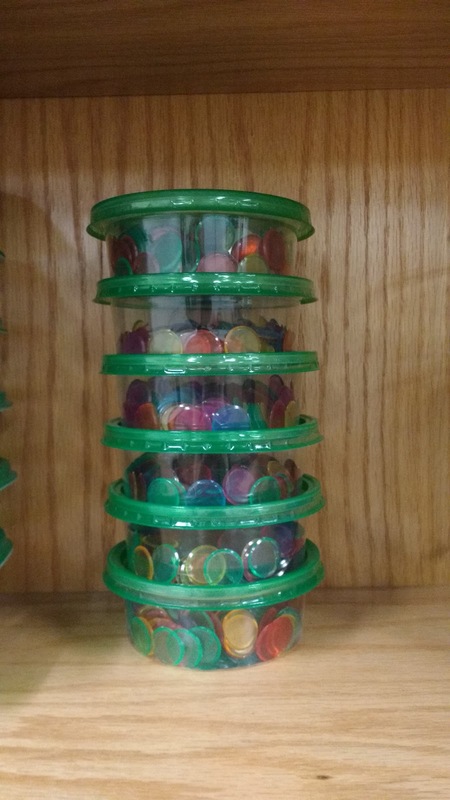 I have six bowls of bingo chips to match the six groups of tables I have in my classroom. When we do an activity with bingo chips (something that happens quite frequently in my classroom), each table can grab a bowl. I used to spend so much time passing chips out to each group. Not any more! Yet another set of bowls (thank you Dollar Tree!) 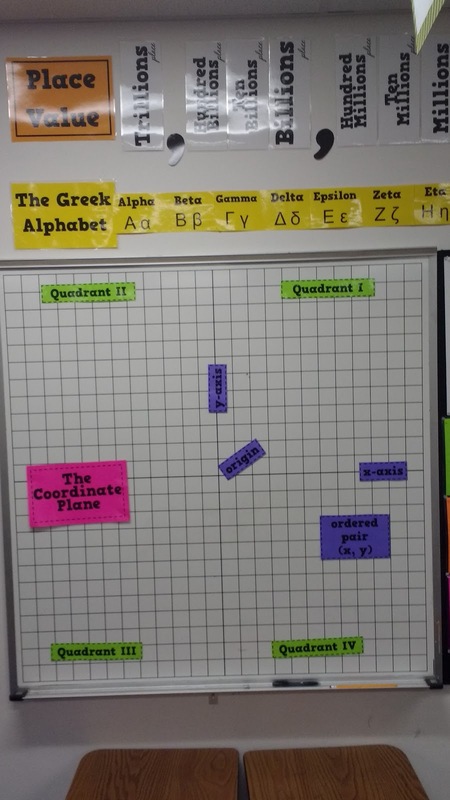 hold pegs and rubber bands for my coordinate plane geoboards. 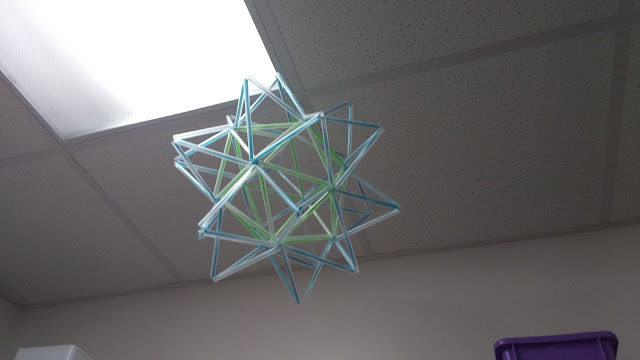 I wrote a blog post about how awesome these geoboards are here. These two shelves hold my games. 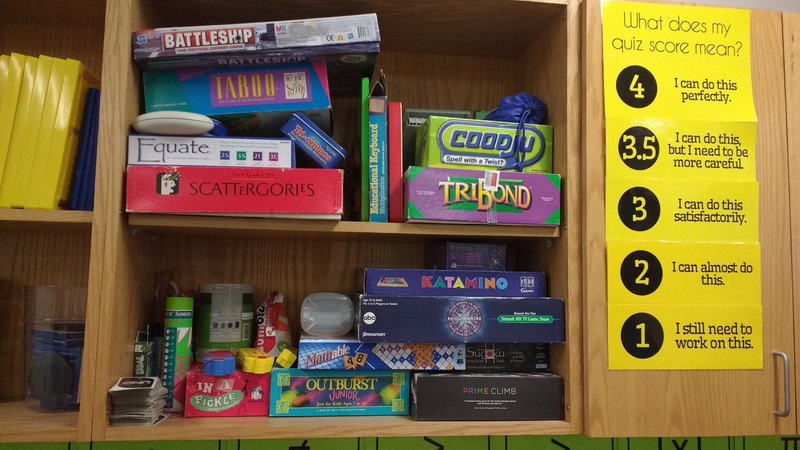 Students who finish early can grab a game. These also come in handy for those days when 80% of the class is gone to a softball game. Did you see my stellated icosahedrons hanging from the ceiling? I made them this summer from straws and ribbon using this tutorial from Janelle Graham. I made them in blue and green, and I LOVED how they came out! 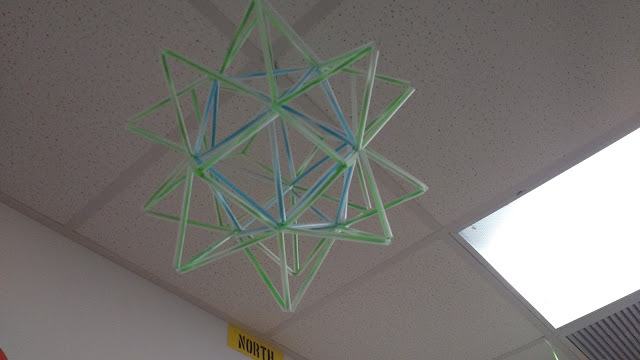 My students keep asking when they'll get to make them. I haven't decided if I want to take on that task yet or not. See my giant dry erase board? 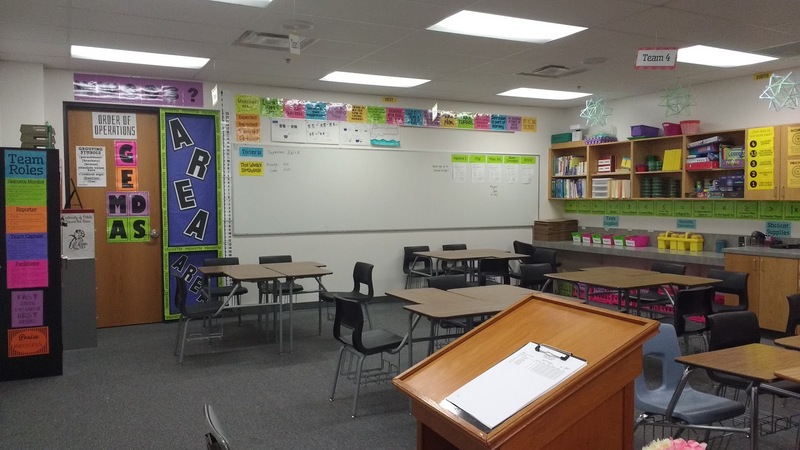 My old classroom didn't have a dry erase board, so my parents bought this 15 foot dry erase board off of craigslist and moved it to my classroom in Drumright. One section of my dry erase board has been turned into a place to write announcements for each of my classes. Right now, I have the instructions for signing up for each class' Remind messaging system. I need to do a better job of actually writing upcoming dates under each header. I also have a laminated poster that says "Today is." Each day, I try and remember to write the date as a math problem. 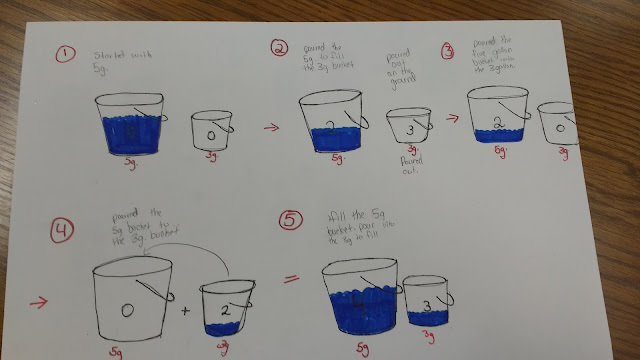 This is a trick I picked up from my cooperating teacher while I was student teaching. 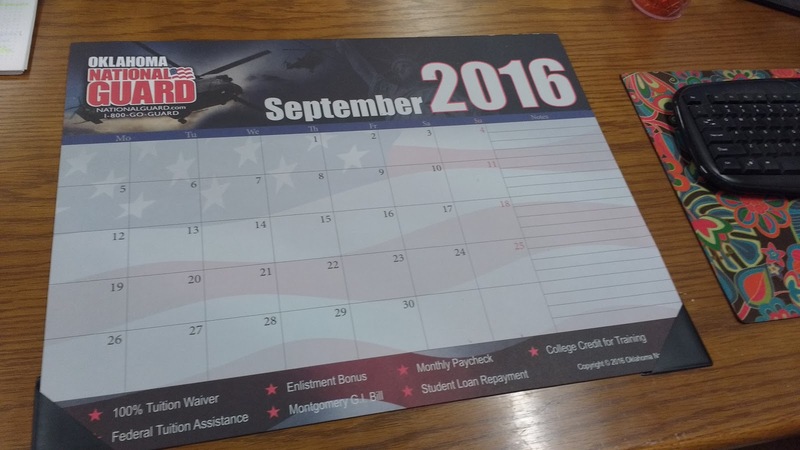 Students HATE it because it makes them do a bit of extra math to figure out the date. You can find the "Today is" mini-poster here. 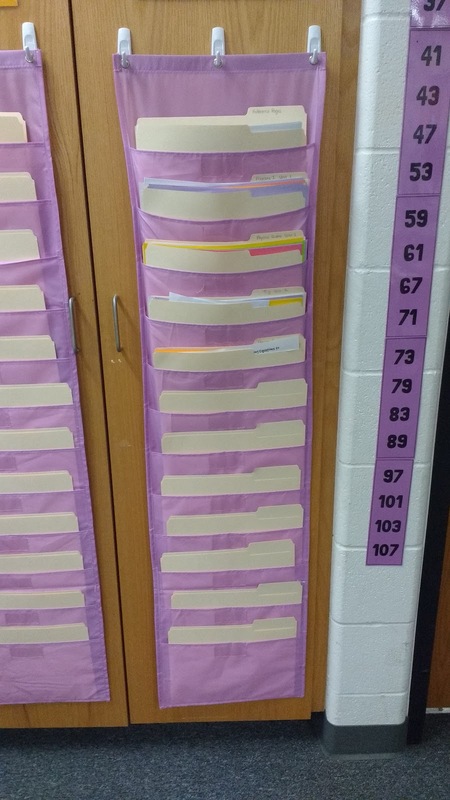 I also made a poster to designate a space to write what students are celebrating a birthday. This was inspired by Hannah's My Favorite at #TMC16. At the end of last year, I overheard a student tell another student that he had been the only person to wish them a happy birthday. Her parents had forgotten it was her birthday. I can't even begin to imagine what it would be like to only hear happy birthday from a single person. And, that student had only wished her a happy birthday because she had told him it was her birthday. What if she hadn't told anyone? I give students a "Happy Birthday" sticker on their birthday. Some think it is childish, but plenty of them proudly wear the sticker around for the rest of the day. 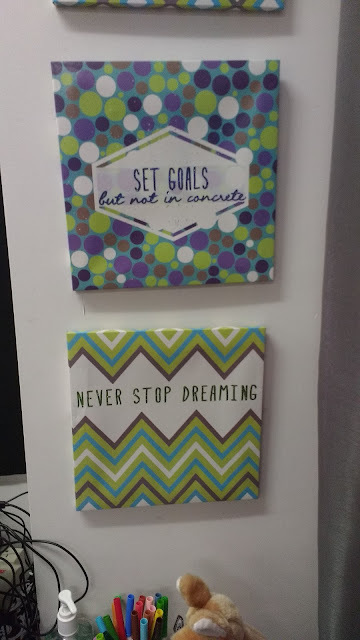 I had planned on giving out Happy Birthday pencils this year, but when I got my order in the mail from Amazon they ended up having motivational sayings on them instead. Luckily, they refunded my money and let me keep the "good work" and "honor roll student" pencils. You can find the "This Week's Birthdays" poster here. 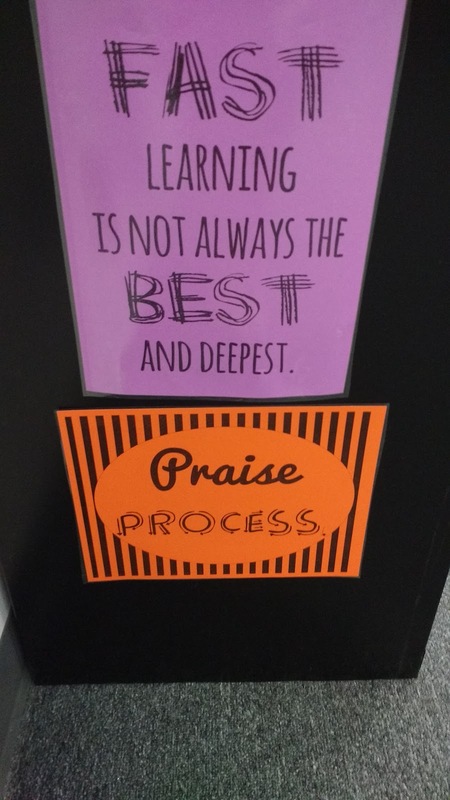 Above my dry erase board, I hung my growth mindset mistakes poster. 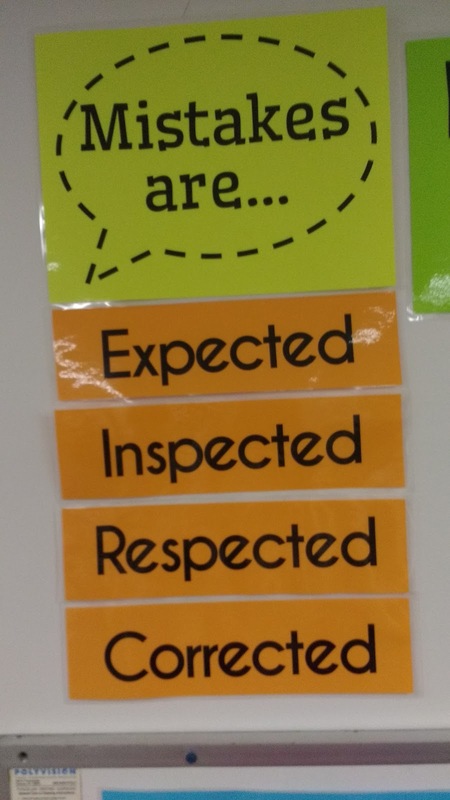 This "Mistakes are expected, inspected, respected, and corrected" poster is based on a quote by Jo Boaler. I posted the files to make this poster here. Also above my dry erase board are my group work norms posters. I wrote a blog post about these here. 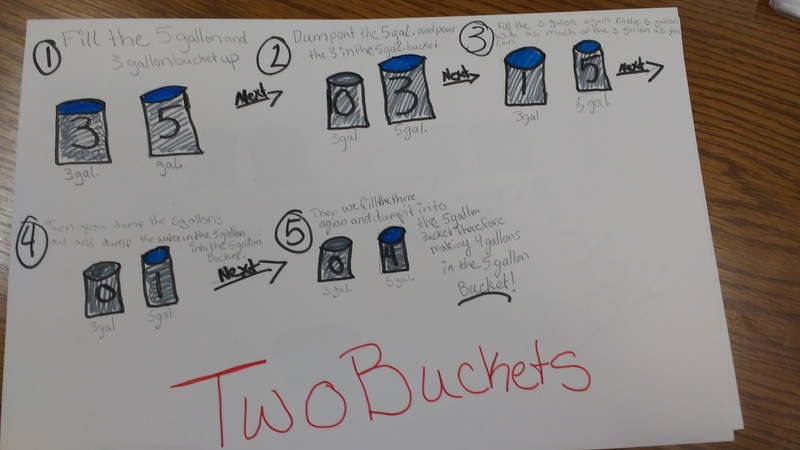 They were inspired by Ilana Horn's Strength in Numbers and Elizabeth G. Cohen's Designing Groupwork. 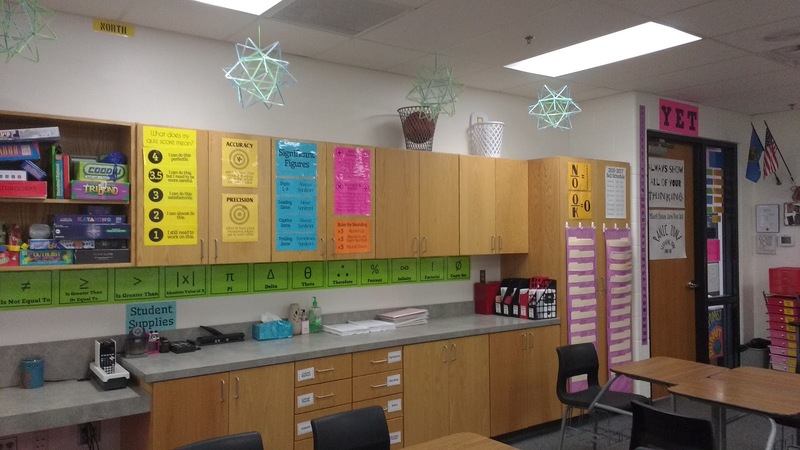 Below these posters, I have two map rails that I use to easily post student work without having to poke holes in the wall with staples or thumb tacks. In the next photo, you can catch a glimpse of one of my cardinal direction posters. Our admin often makes announcements that talk about the "south doors" or something like that. This helps me and my students quickly figure out what they are talking about. I've posted the file for these mini-posters here. I apologize if some of these pictures seem like they are in a random order. They are. If someone had been watching me wander around my classroom taking pictures of everything, they would probably have considered me crazy. 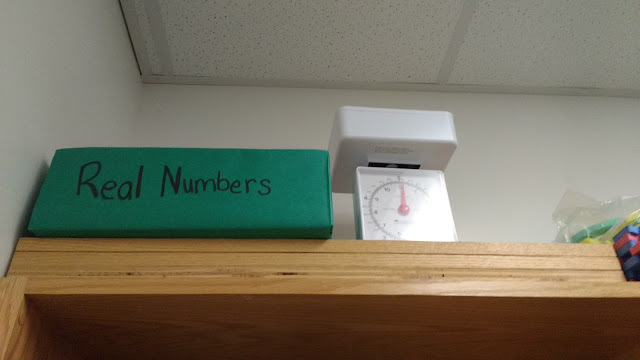 On top of the cabinets, I have my boxes that represent the real number set. You can read my blog post about them here. I also have a plastic scale. 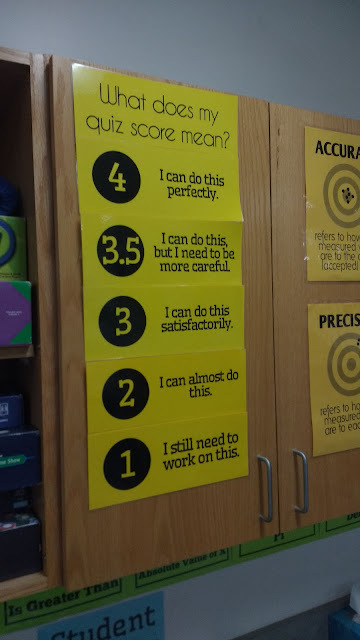 Now that I'm teaching physical science, I'm going to have to get a few more scientific scales. I also thought my collection of Flatland books were notable enough to take a photo of. I picked up 14 copies of this book at a thrift store before my first year of teaching for $2.40 total. The books were 90% off, and I just couldn't resist such a great offer. 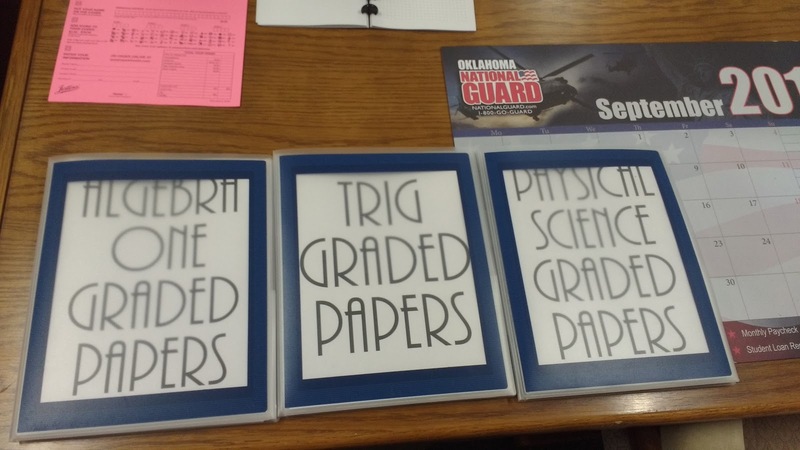 I haven't taught geometry since I bought them, so they've just been sitting their waiting to be read. 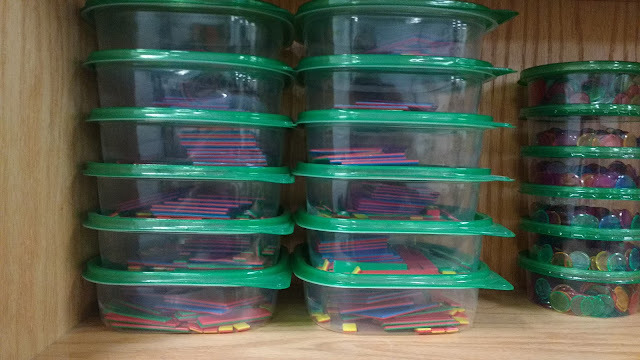 Remember my crates for each class to store their notebooks? Next to them are a clear plastic box and a green crate that hold all of the re-usable activities I have created over the past 5 years. 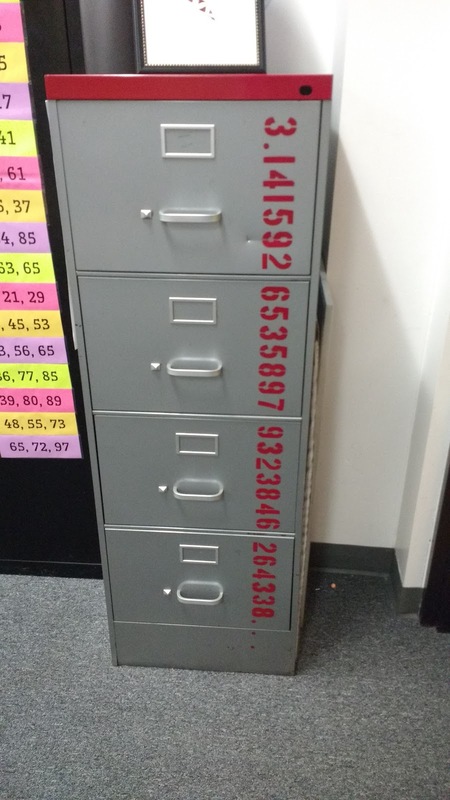 Each activity is in a file jacket. 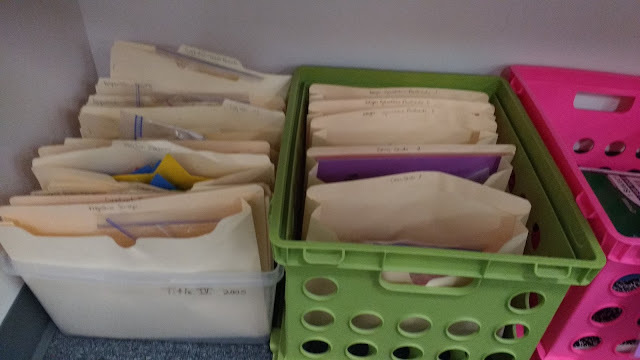 Last year, I misplaced my pile of file jackets, and I ended up taking file folders and stapling the sides. This worked, too! I like how I'm storing each activity in its own file. What I don't like is how I have them stored. I want to find a new home for them, but I don't know what to do about them YET. 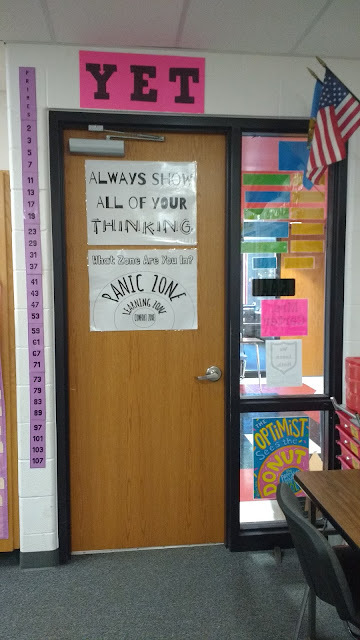 Here's the door in my classroom that leads to the math lab/middle school English class next door. 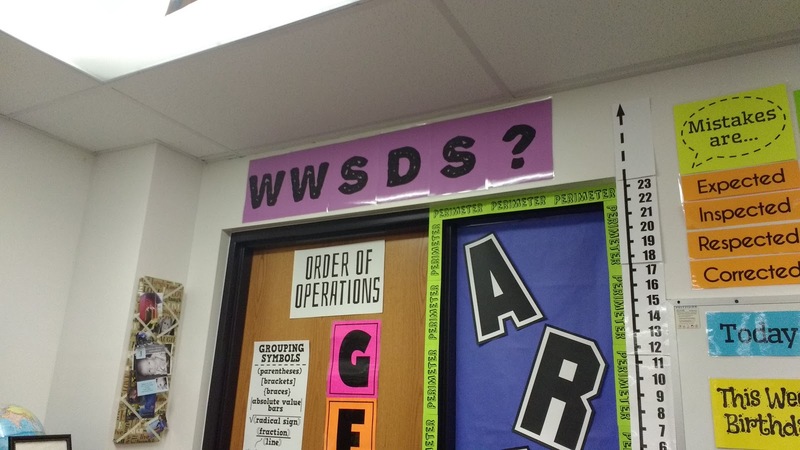 Above the door, I have my WWSDS? posters. These stand for "What Would Slope Dude Say?" I wrote a blog post about these posters here. 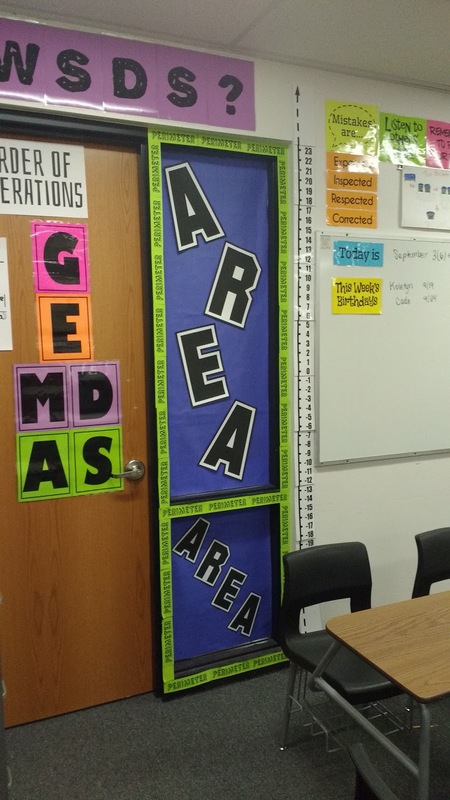 My Area/Perimeter display is an attempt to cover up the window that looks into the adjoining classroom. 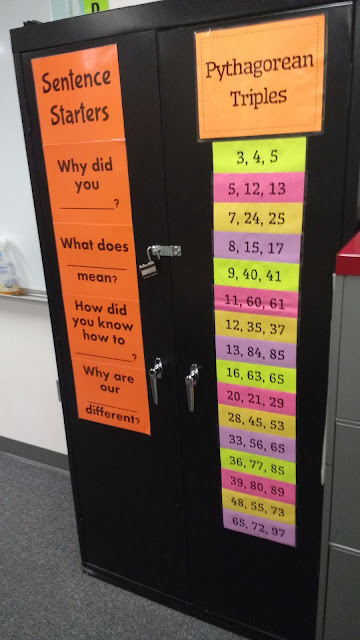 I posted the files for this display here. One of my two vertical number lines is posted next to this window. 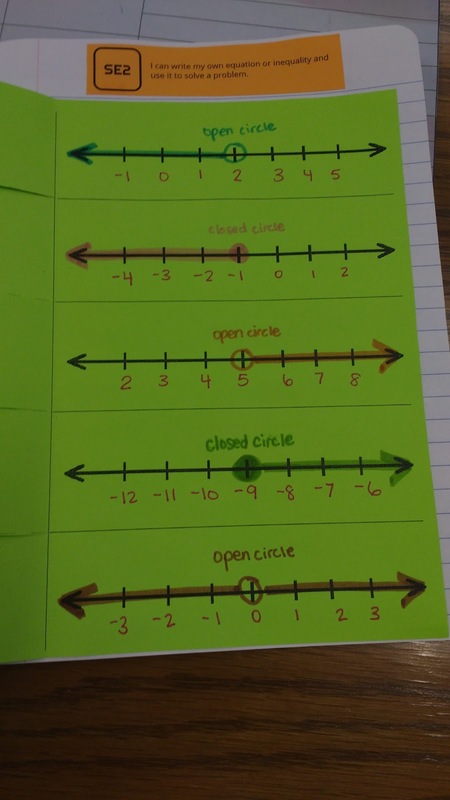 I want to give students the choice between using a horizontal number line or a vertical number line. 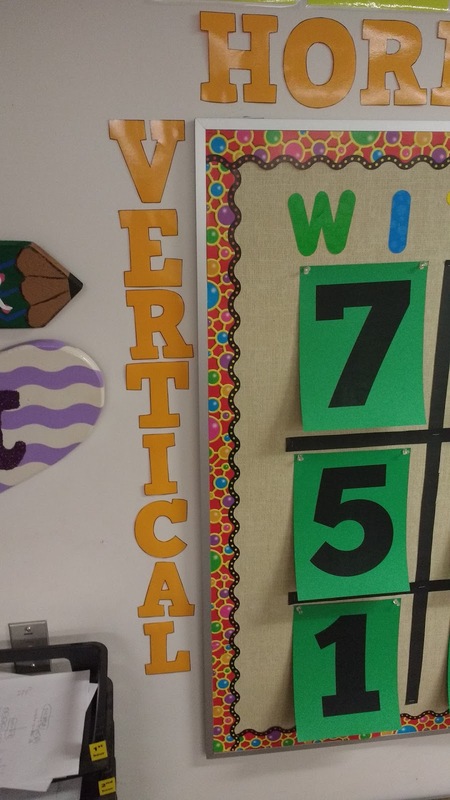 You can find the file for this vertical number line here. 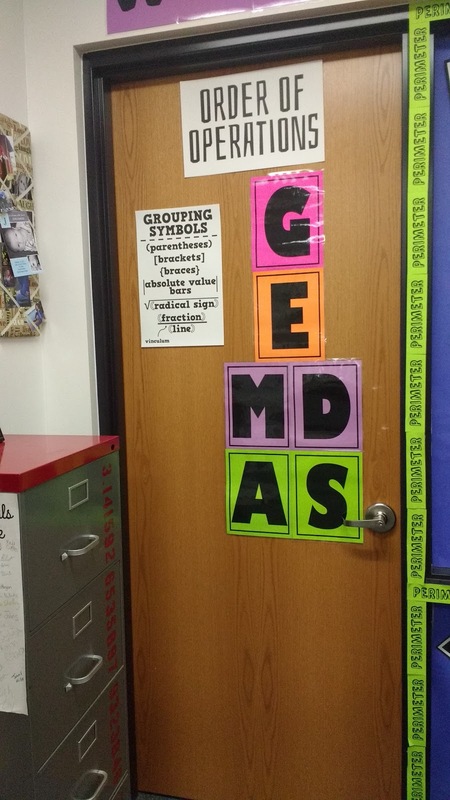 On the door, I have created an Order of Operations display. 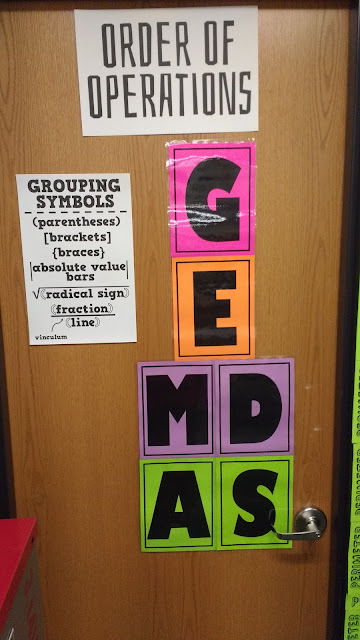 This year, I'm using GEMDAS instead of PEMDAS because I really want to emphasize the different grouping symbols that exist. You can find my order of operations posters here. My filing cabinet has the first twenty-or-so digits of pi painted on it. Kids find this really amusing. We end up talking a lot about how pi goes on forever. 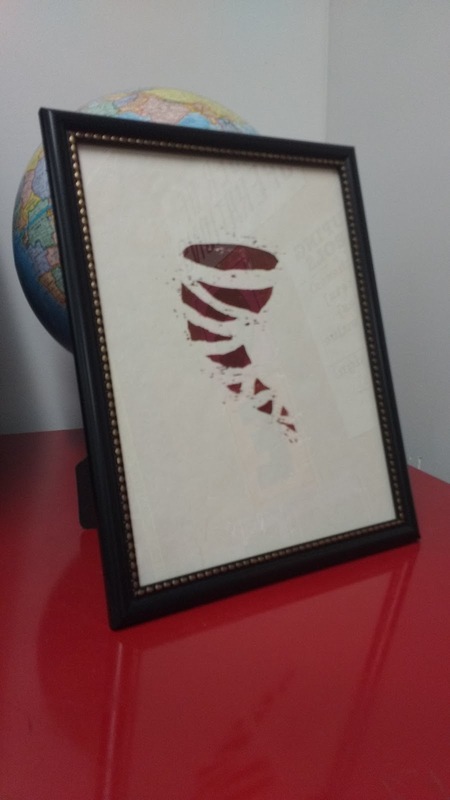 On top of my filing cabinet, I have a tornado print made by my sister when she was completing her art education degree. 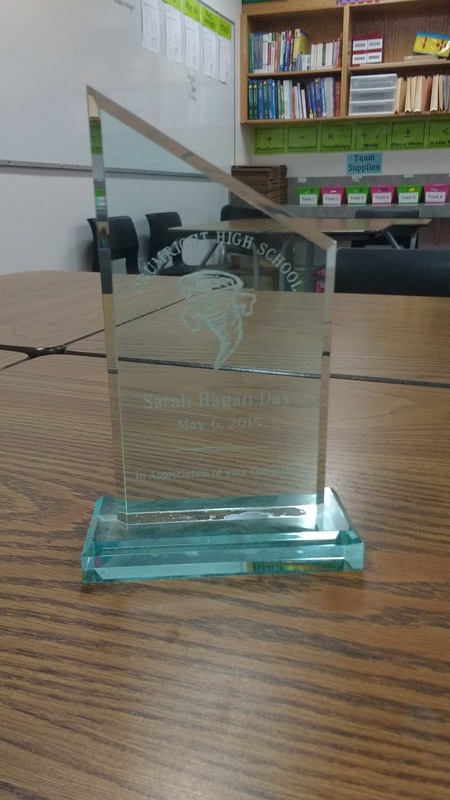 Our school mascot is the tornado, so it's perfect for my classroom. Behind the picture frame, you'll find my globe. This has come in handy seeing as I married a guy from Australia. When I visited Australia during the summer of 2015, one of my students asked if I drove or flew. My black storage cabinet is the perfect place to hang more posters! 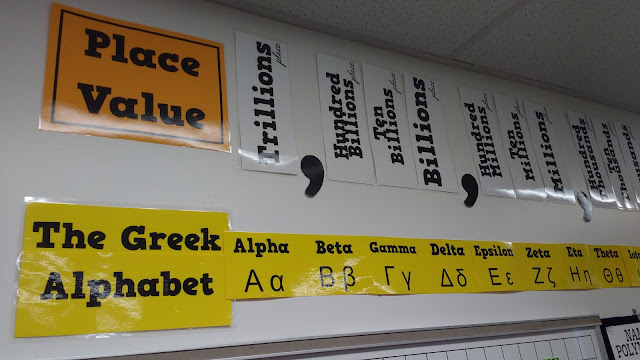 You can find my sentence starter posters here and my Pythagorean triple posters here. Inside my cabinet, you'll find boxes. Lots and lots of boxes. I wrote more about organizing my cabinet and supplies here. The top of my cabinet has some unused paper trays and my trophy/plaque/I don't know what to call this thing. It was presented to me on "Sarah Hagan Day." This was the day where my school held an assembly in my honor, and the city manager and mayor of Drumright presented me with a key to the city. This was motivated by the positive attention I drew to the city after being featured as one of NPR's 50 Great Teachers. You can read my NPR story here and find out more about my key to the city here. 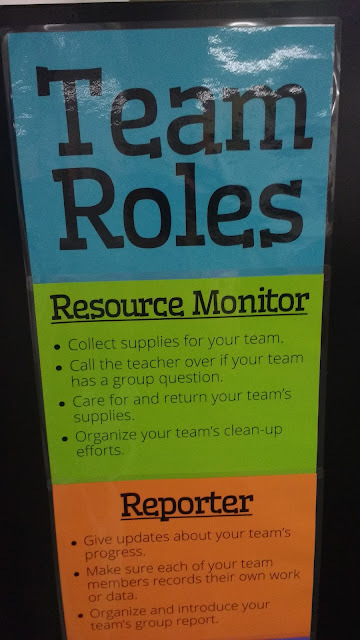 The side of my storage cabinet holds my group work roles posters. If you look closely, you can see my "Fraternity of Petals Around the Rose" poster in the background here. I would post a close-up of the poster, but my students signed it with their first and last names. I need to protect their privacy. Students get to sign this poster when they crack the secret of Petals Around the Rose. Not sure what that is? 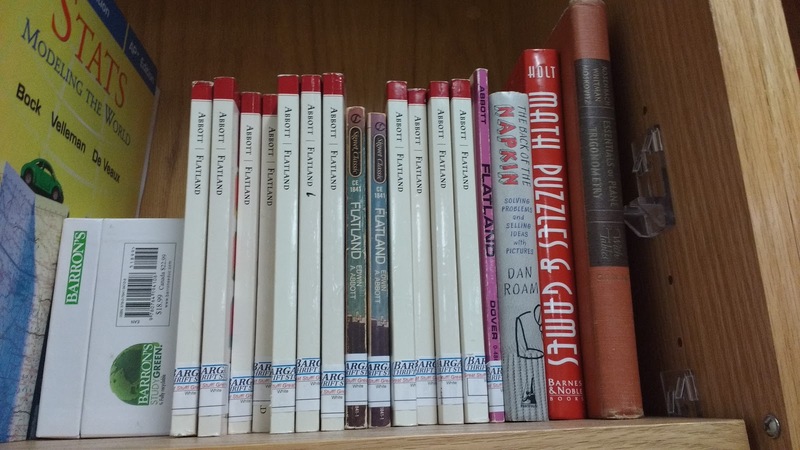 Check out this post about my favorite brain teasers! 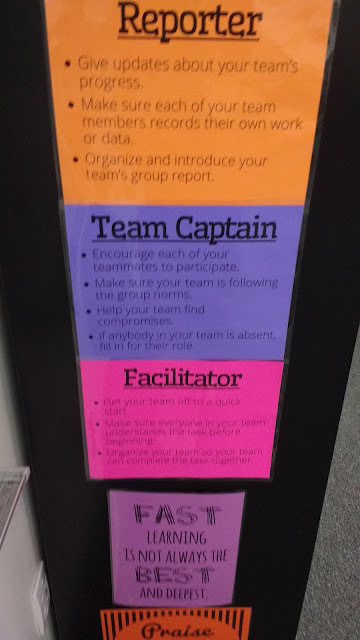 These are color coded to match with my group role badges. These two posters at the bottom were inspired by an #EduRead conversation. I posted the files for them here. Above my dry erase board at the front of the classroom, I have another acknowledgement of Slope Dude. I made a set of posters that recreate his journey. 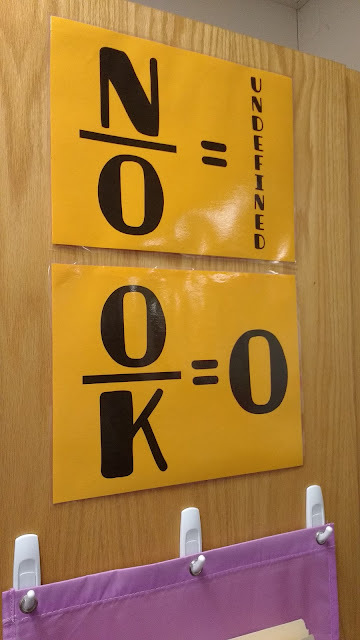 This gives students a visual to remember the difference between zero slope and undefined slope. I blogged about these posters and uploaded the file for them here. You should also be able to see my horizontal number line above my dry erase board in the previous picture. I made this number line using a file I found online. I blogged about more details here. 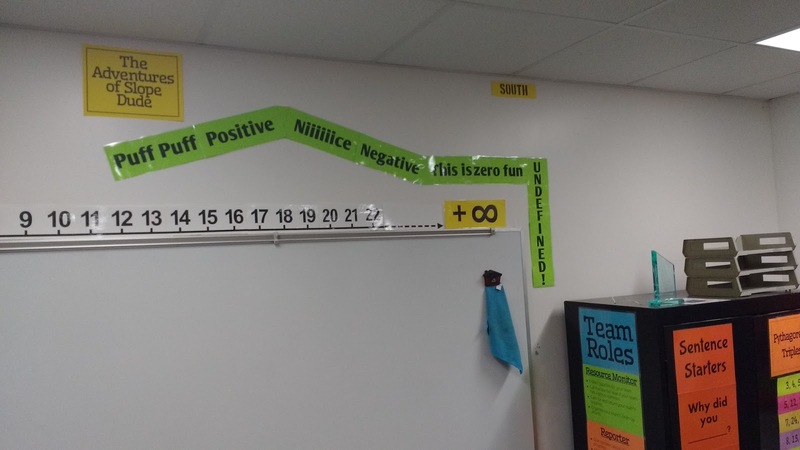 What's new this year is my addition of a positive infinity and negative infinity at the ends of the number line. This always throws my students for a loop when we start talking about domain and range. I posted the files for these infinity symbols here. 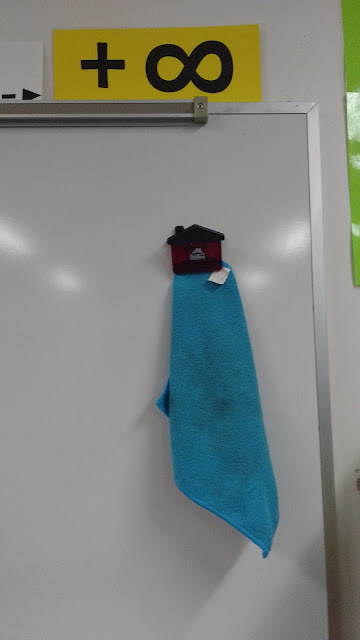 Too keep my room more organized, I have a clippy magnet that holds my microfiber cleaning cloth that I picked up at Dollar Tree this summer. 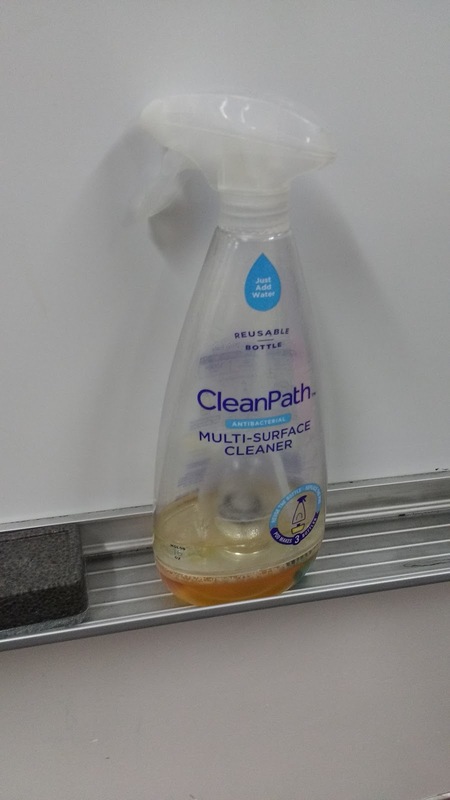 When my students need a spritz of cleaner to remove stubborn dry erase marker from their boards or laminated activities, I use this cleaner I got from Wal-Mart. It's concentrated. For around $3, I got enough concentrate to make 3 bottles. I use half as much concentrate as it calls for, so I end up getting 6 bottles worth of cleaner for only $3. This magnetic caddy is a lifesaver this year. I use it to hold my remote control for my projector/SMARTBoard. This is one of those things that I misplace over and over and over and over. Having a place to put it each time I use it hasn't cured all of my remote control losing problems, but I find myself searching for it much less than I have in previous years. 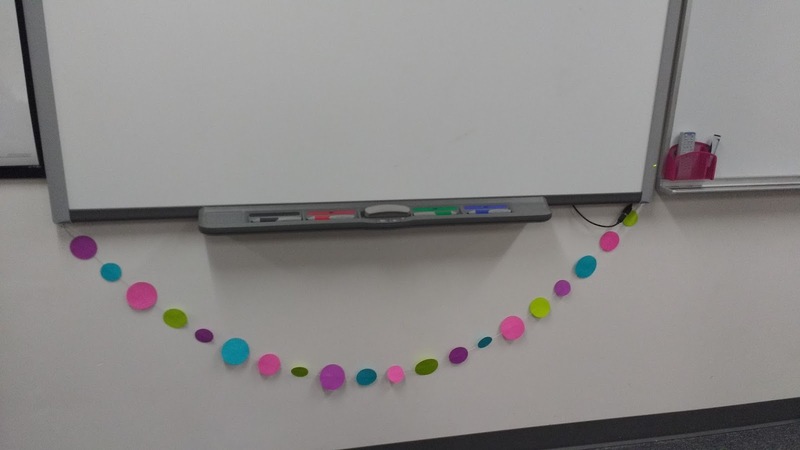 Underneath my SMARTBoard, I have a polka dot pennant that I picked up in the party decor section of Wal-mart a couple of years ago. 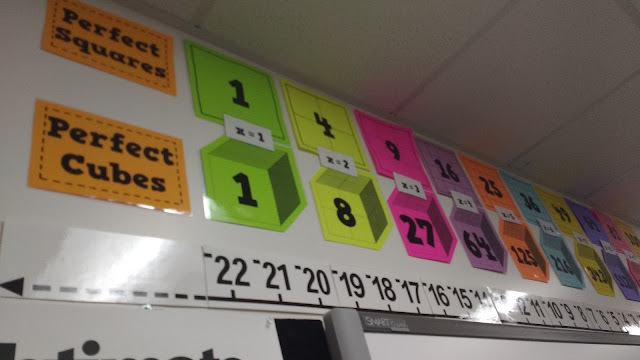 Above my SMARTBoard and horizontal number line, I have posters of the perfect squares between 1 and 100 and the perfect cubes between 1 and 1000. 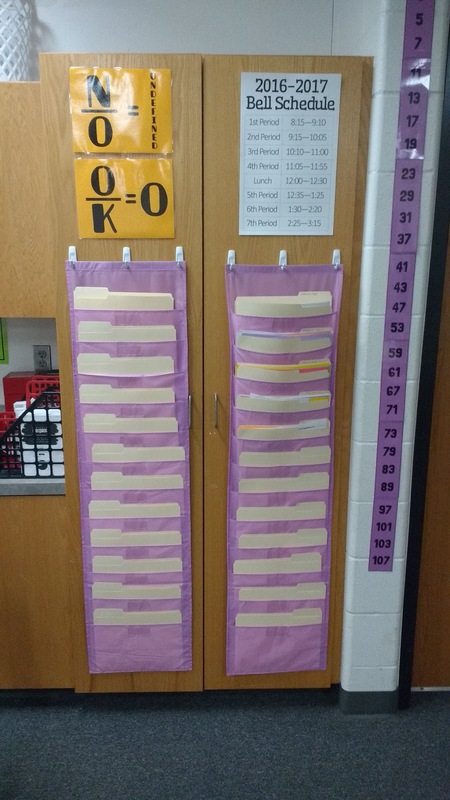 I stole this idea from the amazing blog of Clarissa Grandi. I posted the files I made for these posters here. Here's a close-up of the perfect square and perfect cube posters. 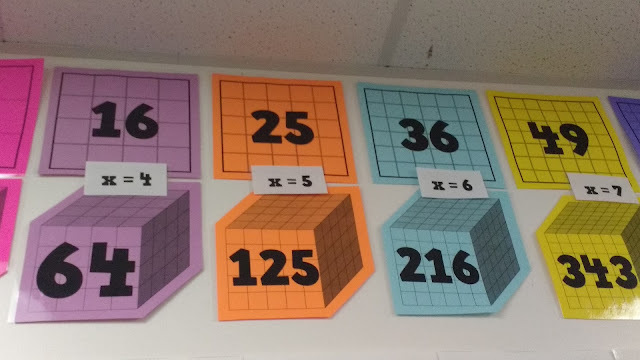 This past week, I added x = 1, x = 2, ..., x = 10 to the posters to make it easier to tell what number was being squared or cubed. 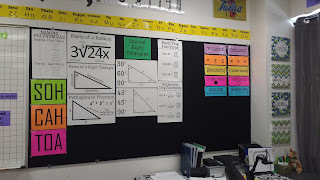 Next to my SMARTBoard, I have a bulletin board that was moved over from my old classroom. This holds my TI-30XS poster that I use ALL the time to show students where various buttons on the calculator. 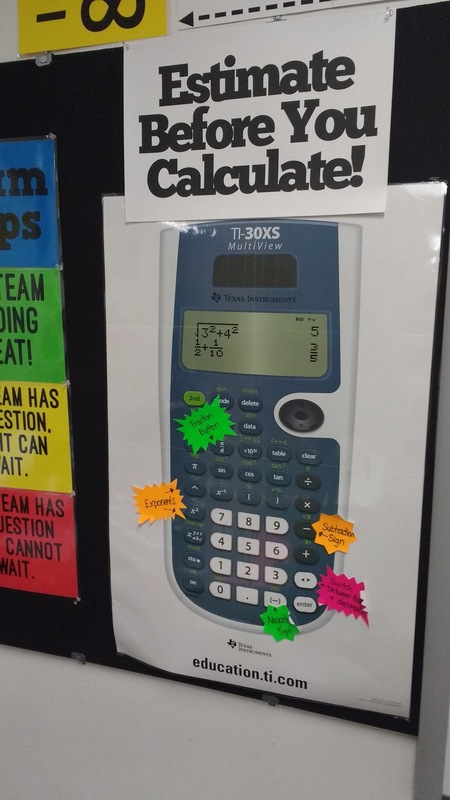 Above the calculator poster, I have an "Estimate Before You Calculate!" poster. You can download the file for that poster here. The font is ChunkFive Roman. I printed this poster on 11 x 17 card stock. This is the perfect size of cardstock to make my own posters at school using our regular copy machine. A long time ago, I added these starbursts (bought a package at Dollar Tree) with notes about commonly used/confused calculator buttons. They're bent up after a few years, but I just haven't found the time/energy to replace them. 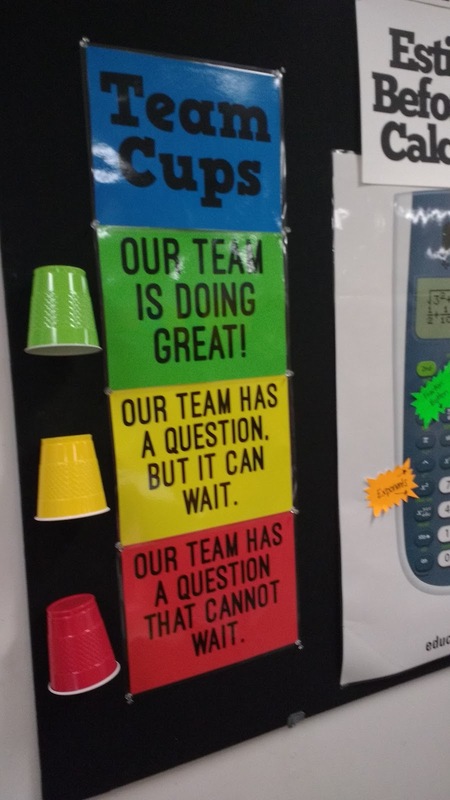 Next to the calculator poster is my set of Team Cups posters. 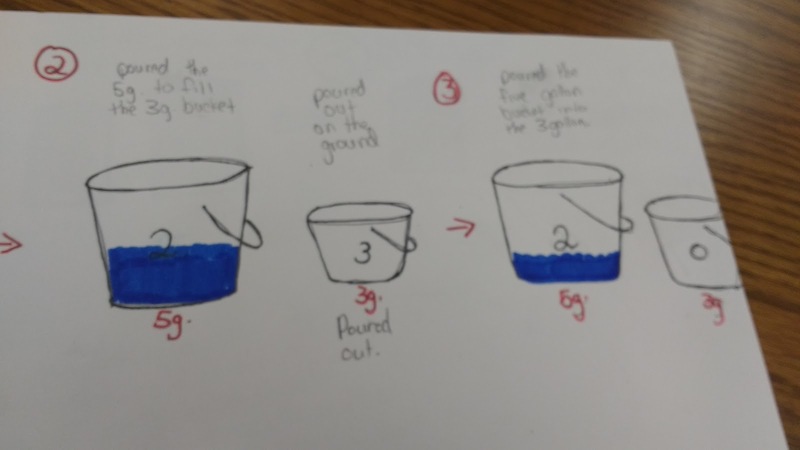 I posted about my use of red/yellow/green cups for group work here. You'll also find the downloads for these posters there. 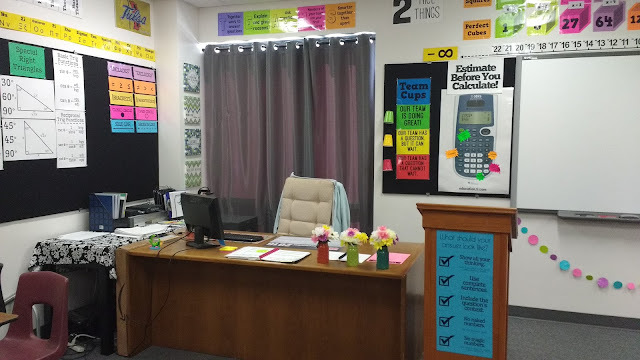 :) Thanks to a kind tweep for the idea of hanging up the cups next to the posters! 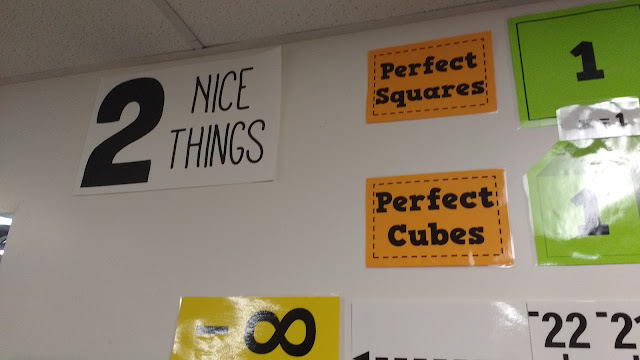 You'll also see my "2 Nice Things" poster on the wall above that bulletin board. This is an idea I stole a long time ago from Elissa Miller. When a students says something mean toward another student/themselves/anything, they have to say two nice things about that same thing. You can find the file for this poster here. It's also designed to print on 11 x 17 cardstock. 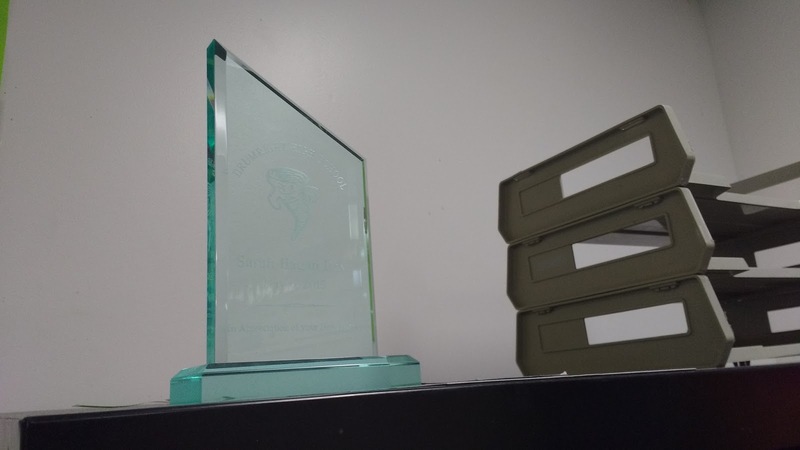 Next to my desk, you'll find my podium. My mom found this at a thrift store a couple of years ago. 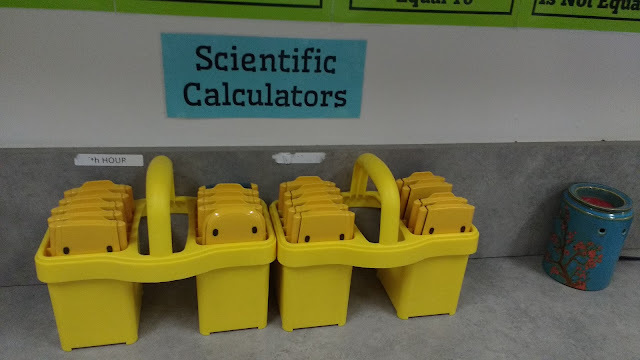 I don't really teach from it, but it's a great place to keep a clipboard with important information I need to access frequently through a lesson. It's also got cabinets underneath that double as storage! 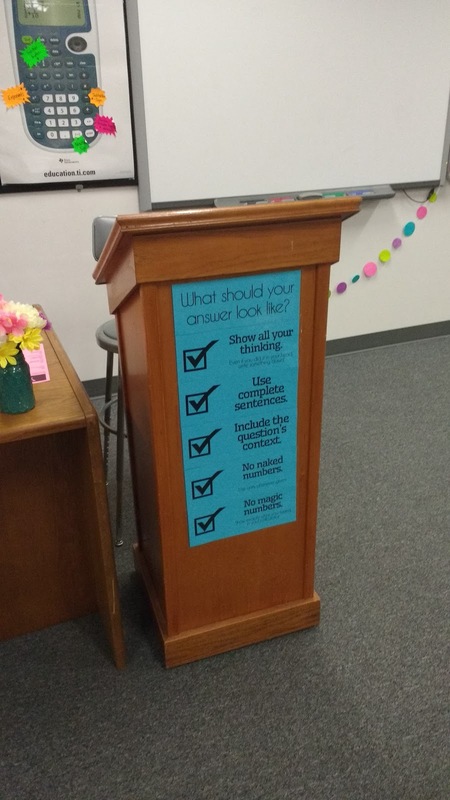 My podium holds my "What should your answer look like?" posters. These summarize to my students how they should write up a solution. This is something I don't think a lot of my students have ever thought about before. You can find the post with the files for these posters here. 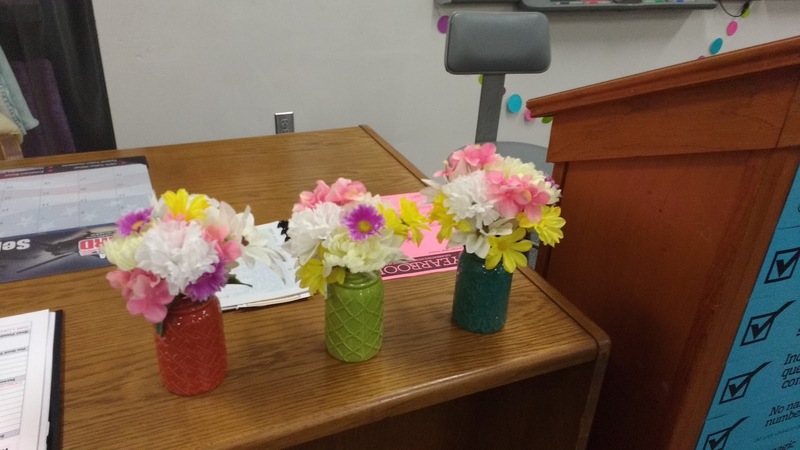 On my desk, I have three vases that I picked up two summers ago at Dollar Tree. They are filled with fake flowers that I also picked up from Dollar Tree. I've received several compliments on them, and I even had a colleague think they were real. They're pretty, colorful, and they bring a smile to my face. My desk backs up to this window. The blackout curtains keep the most of the light out, but the sun shining on these curtains make the curtains VERY hot which makes my little desk corner uncomfortably warm at certain times of day. My desk has to go in front of the window, though, because this is the only place where all the plugs and such for my computer are. Behind my desk, I have these four inspirational canvases that I picked up at Family Dollar a couple of years ago. 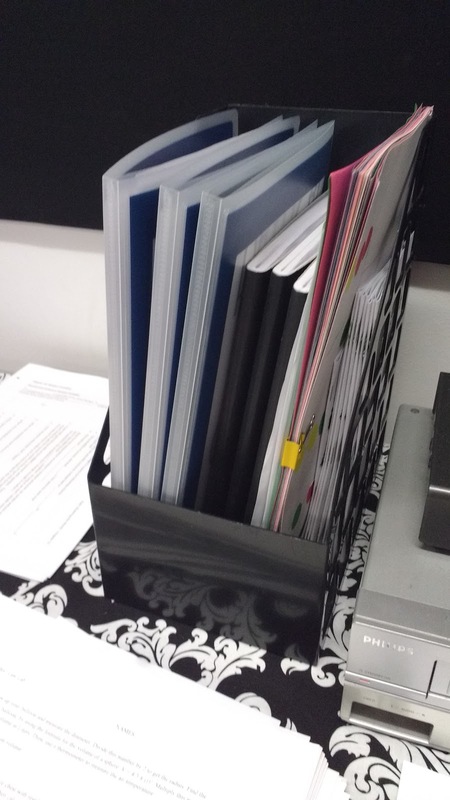 I have a small filing cabinet behind my desk. On top of that, I have my stuffed kangaroo (holding a boomerang, of course! 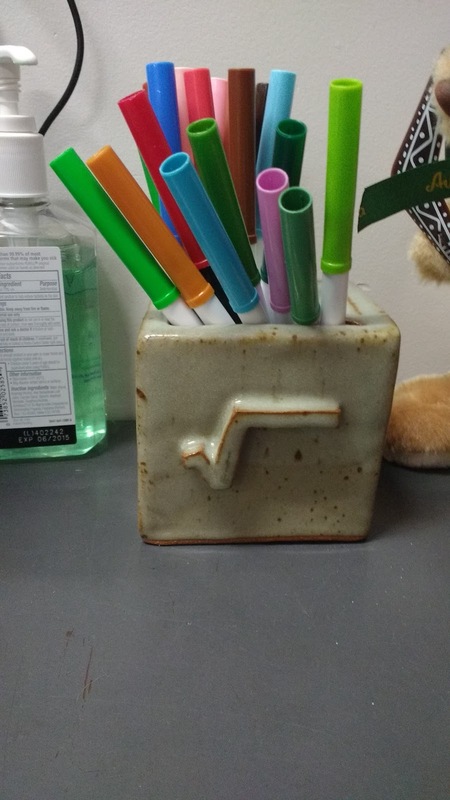 ), hand sanitizer, and my math-y marker holder. When I spent the summer of 2015 in Australia, I was pretty obsessed with seeing as many kangaroos as possible. 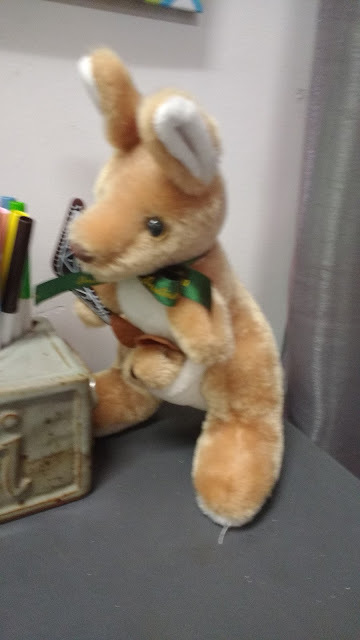 Upon my return to the states, my mom and sister gave me this stuffed kangaroo that they had picked up from a thrift store. Someone else had gone to Australia and brought this back as a souvenir. 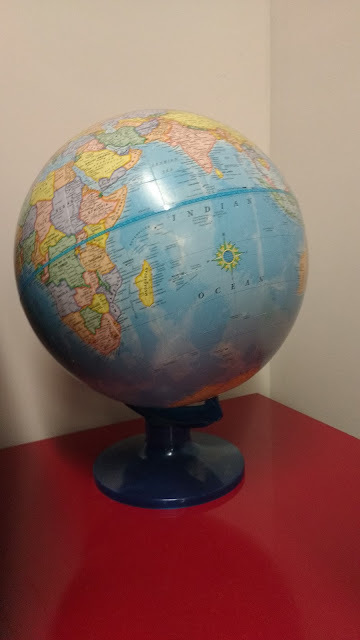 When Shaun and I were still continents apart, it was nice to have this little reminder of the time I was able to spend with him in my classroom. 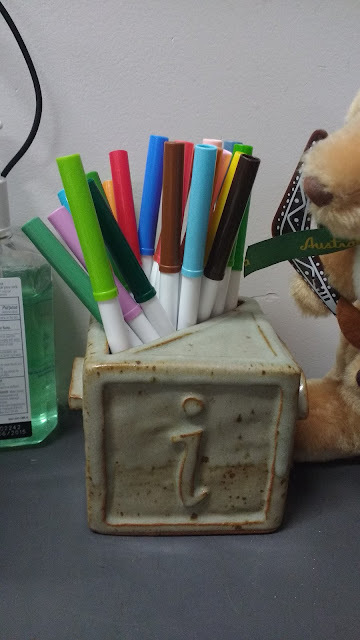 The marker holder was a gift from my sister. She made it as one of her projects in college. 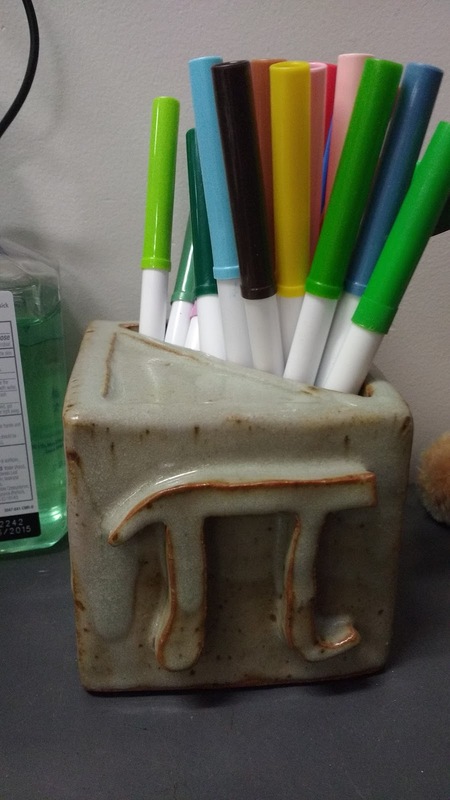 Each side of the marker holder features a different mathematical symbol. It turned out ADORABLE, and I love it! 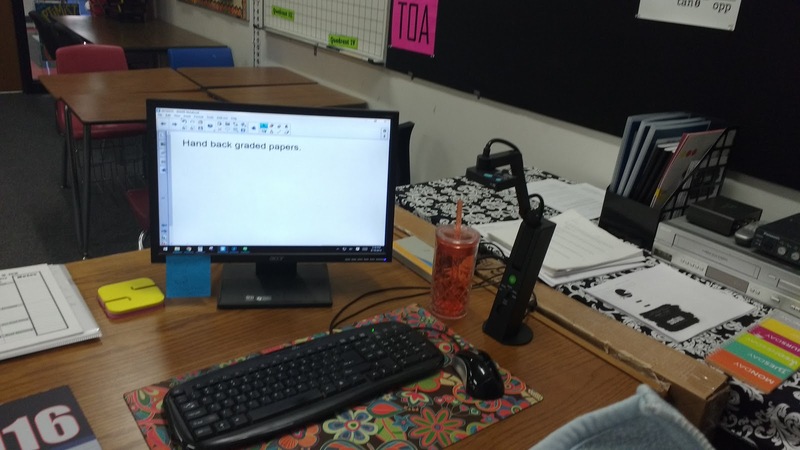 Last year, I was able to write a grant to receive six Asus tablets for my classroom. I'm using a wire desk organizer to organize my tablets. It's working pretty well, but the cords for all the tablets are still a mess. Beside my desk, I have my Includes vs. Excludes posters. 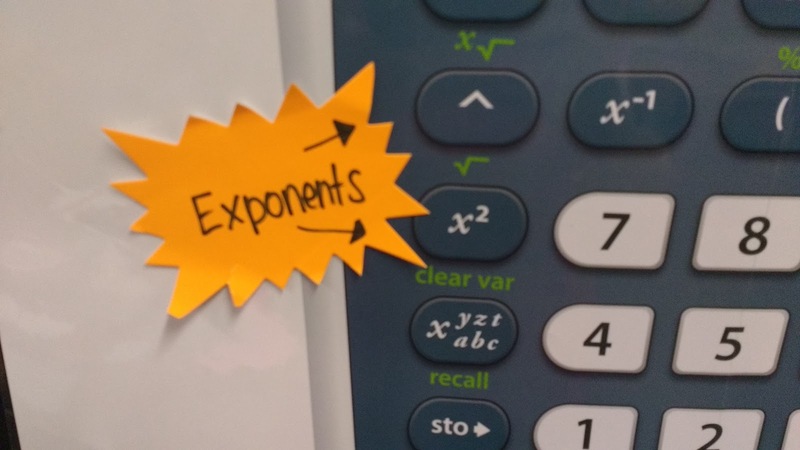 My student aide is currently taking pre-calculus, and he's already found them very useful! You can find the file for these posters here. 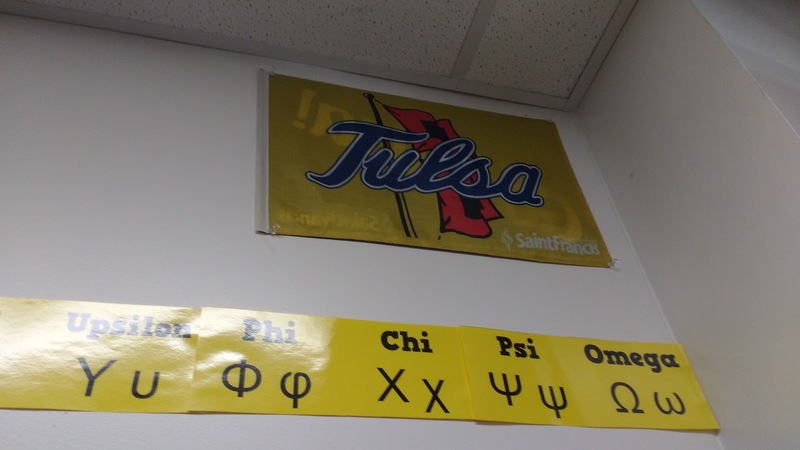 I also have my Tulsa flag hanging on the wall to show my pride for my alma mater, the University of Tulsa. Given the fact that I just earned my master's through the University of Texas at Arlington, I should probably get some sort of UTA decoration to hang in my room, too. On my desk, you'll find my computer and my new Ipevo document camera. 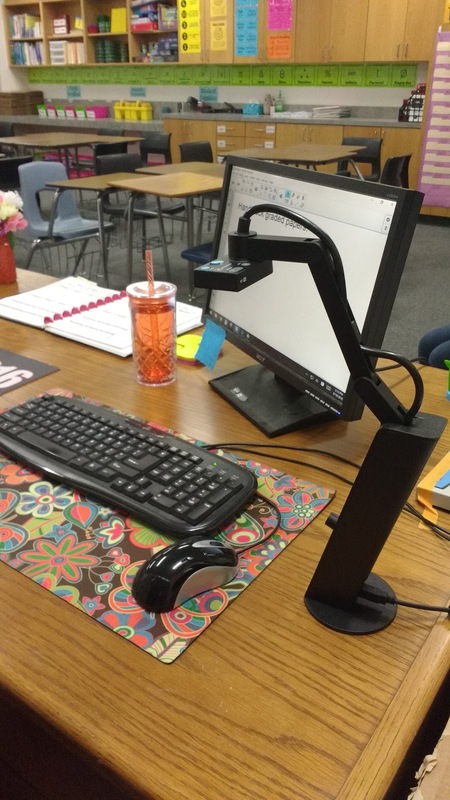 I received this document camera for free from Ipevo for submitting a request on their Wishpool website. I have a new desk this year which means I actually have room for a desk calendar. I've never had one before, and I'm not sure it it's a must-have or not yet. 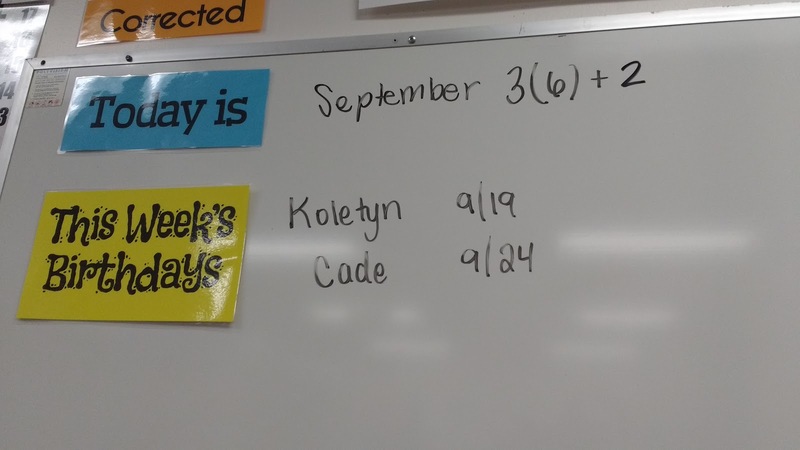 It is nice to be able to quickly glance at a date while entering grades in my gradebook. Sitting on my desk, you'll find my newly created bullet journal. Since my to do list is kind of a private matter, I'm posting a picture of a blank page. 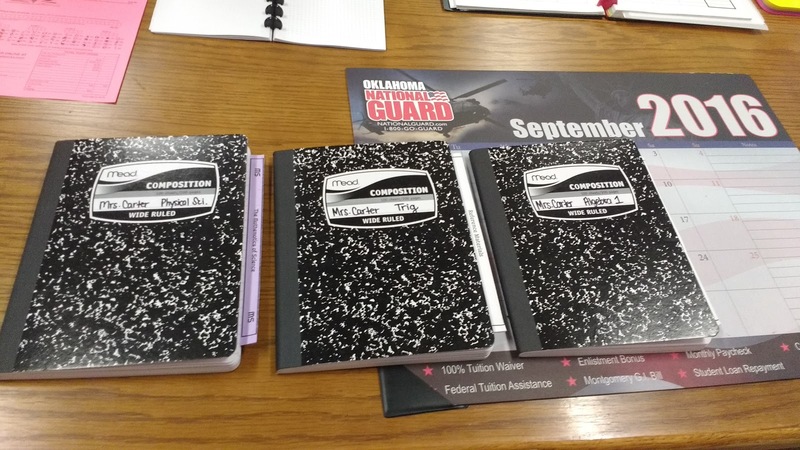 I created it using the Arc notebook system from Staples. I use this small book (each page is half of a letter sized sheet of paper) to keep track of my never-ending to do list. I like to keep my to do list separate from my planner. I also have my planner laying on my desk. 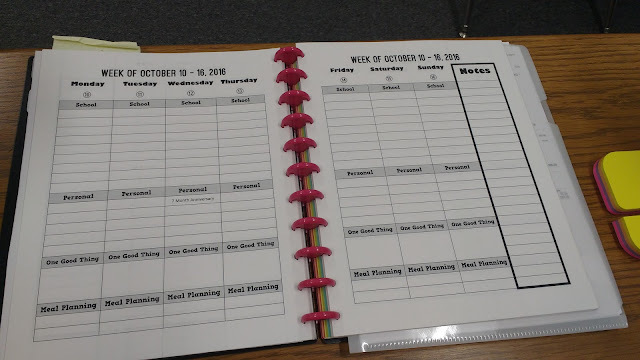 This planner also uses the Arc notebook system. 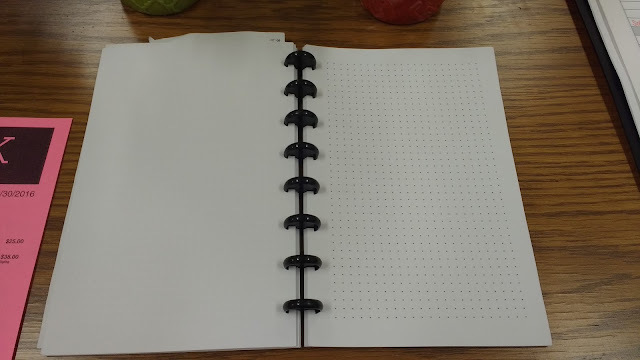 I've blogged about my planner pages here. Instead of a mouse pad, I have a desk mat that doubles to hold my keyboard and my mouse. 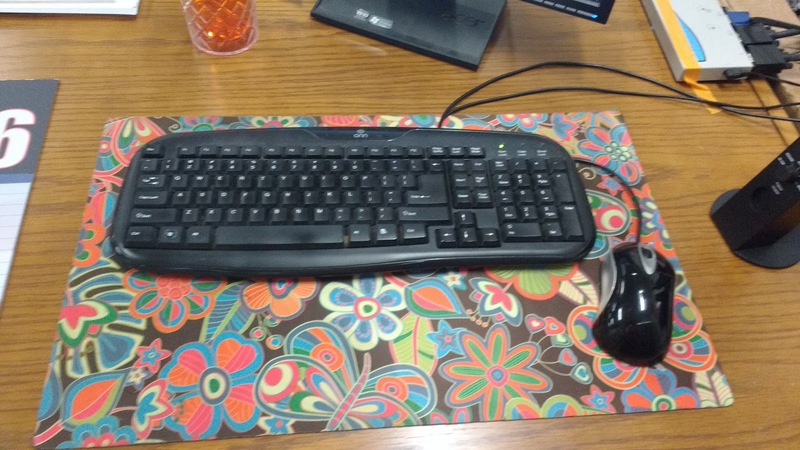 It also adds a happy bit of color to my desk. 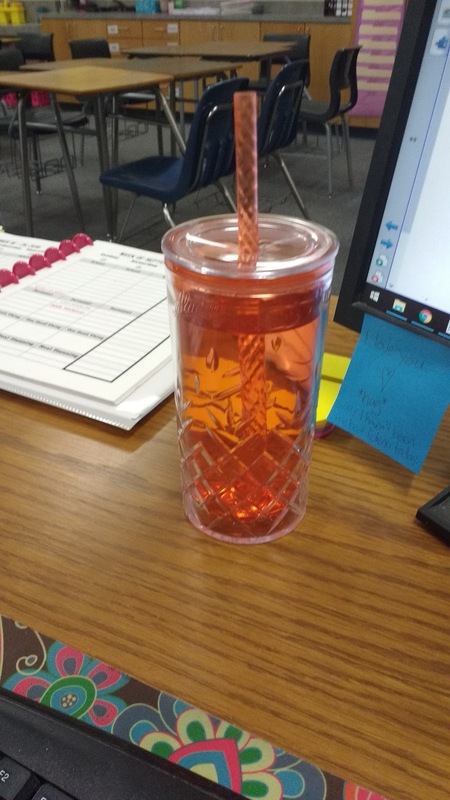 This year, I invested in a cup to keep on my desk at all times. I fill it up each morning when I put my lunchbox in the refrigerator in the teacher's lounge. I picked it up for $1 at Wal-mart on clearance at the end of summer. 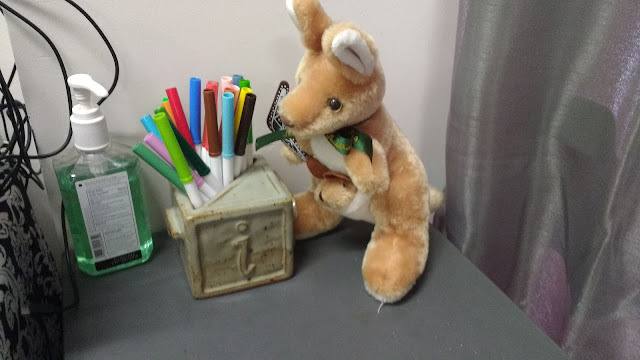 On the table beside my desk, I have a plastic magazine holder to keep track of all the stuff I need to reference frequently but don't want laying on my desk. 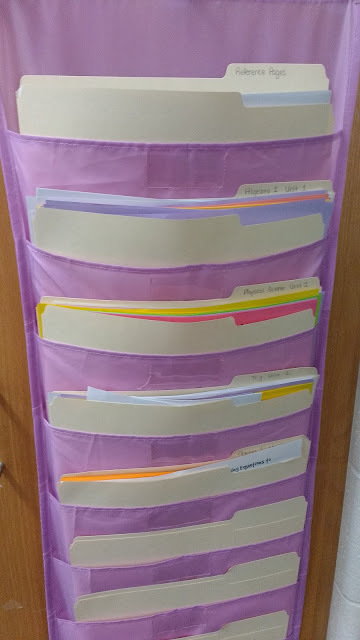 These 6-pocket organizers hold all of my graded papers that need to be passed back to my students. When I typed the covers for these, I didn't realize that the border would hide some of my text. Eventually, I'll retype the covers, but that might not happen until next year. 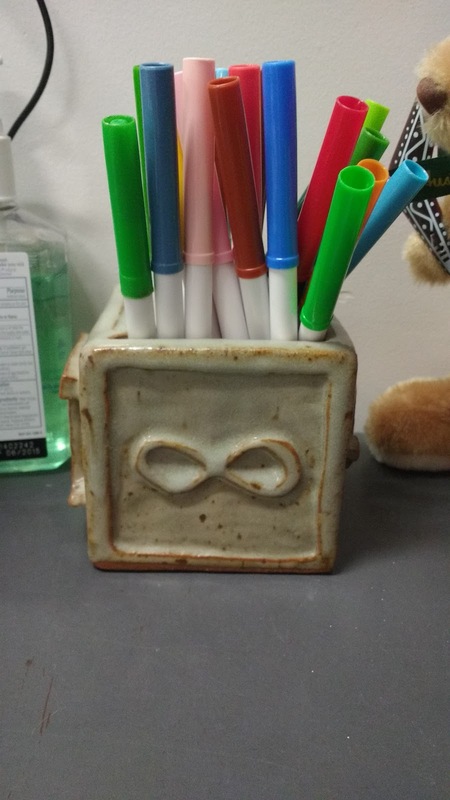 I also keep my copy of our interactive notebooks in this holder. I have an interactive notebook for Algebra 1, Trig, and Physical Science this year. My Math Concepts students are not creating a notebook this year. My desk isn't perfect this year, but I feel like it's the most organized it's ever been before. It has various posters. 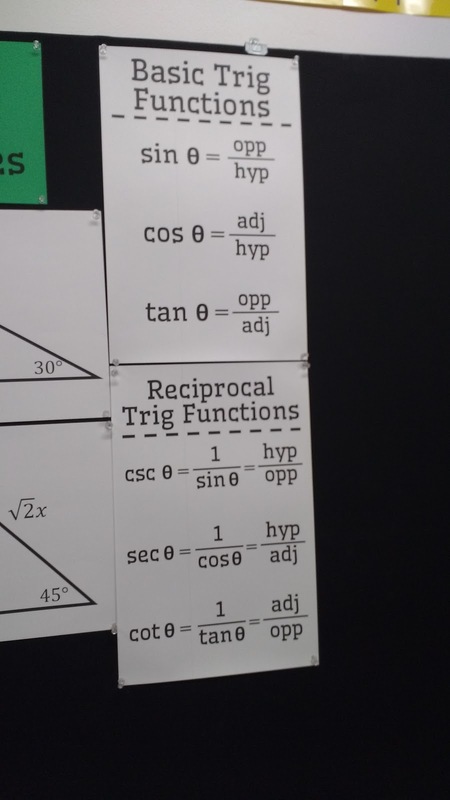 Here's the link for my trig function posters. I've already posted before about my Special Right Triangle posters. 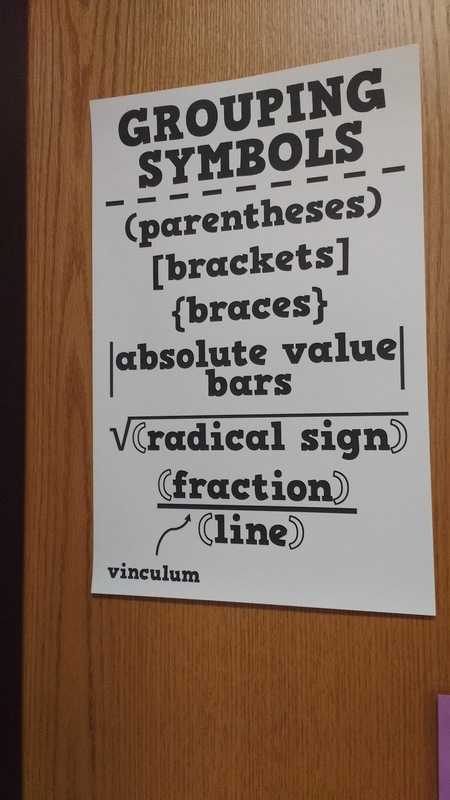 My "Parts of a Radical" poster can be found here. 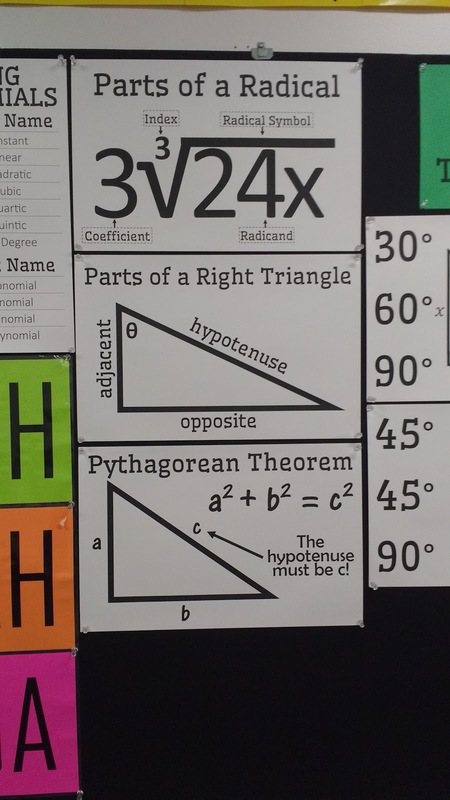 My "Parts of a Right Triangle" poster can be found here. 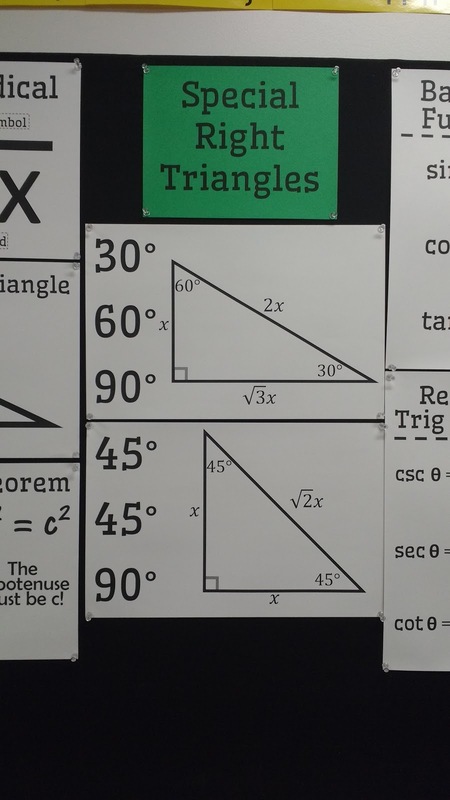 And, my Pythagorean Theorem poster can be found here. 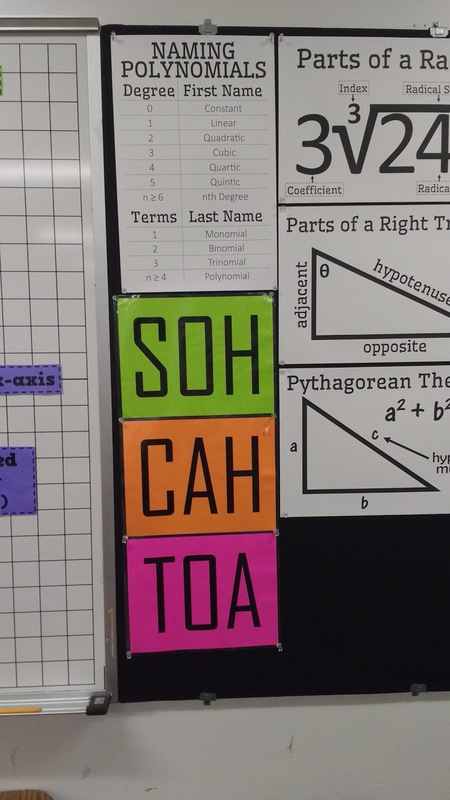 You can find my "Naming Polynomials" poster here and my "SOH CAH TOA" poster here. Next to my bulletin board, I have a 4 foot by 4 foot magnetic coordinate plane dry erase board. This summer, I made a set of magnets with the parts of the coordinate plane on them. I blogged about these magnets here. 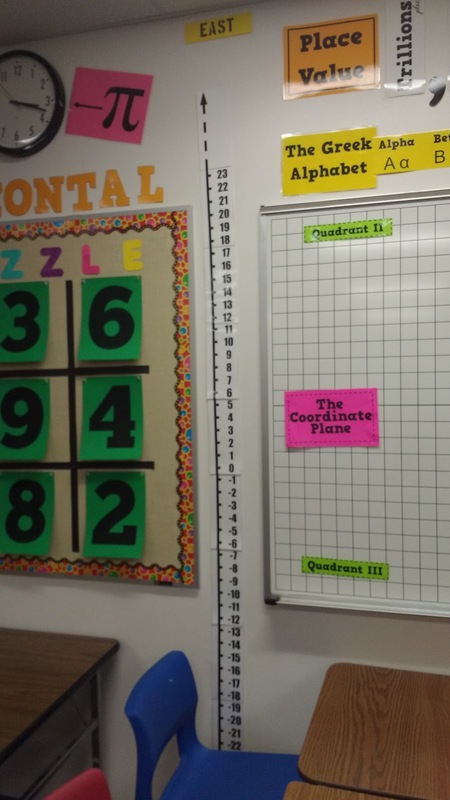 Next to the coordinate plane, I have my second vertical number line. 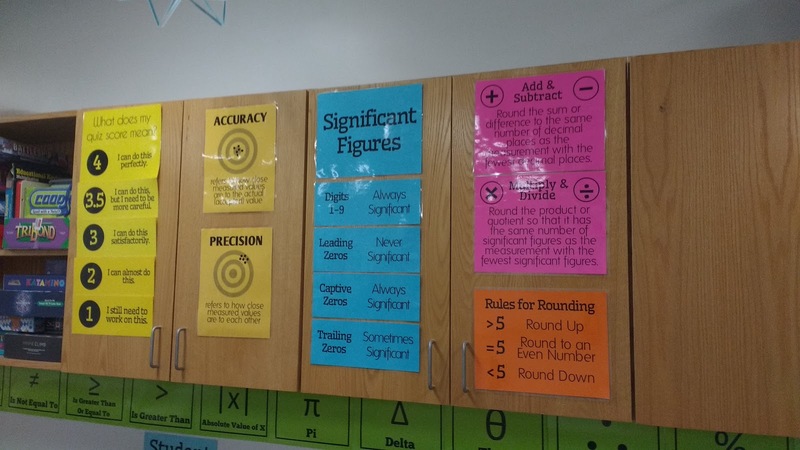 Above the coordinate plane, I have another two sets of posters. 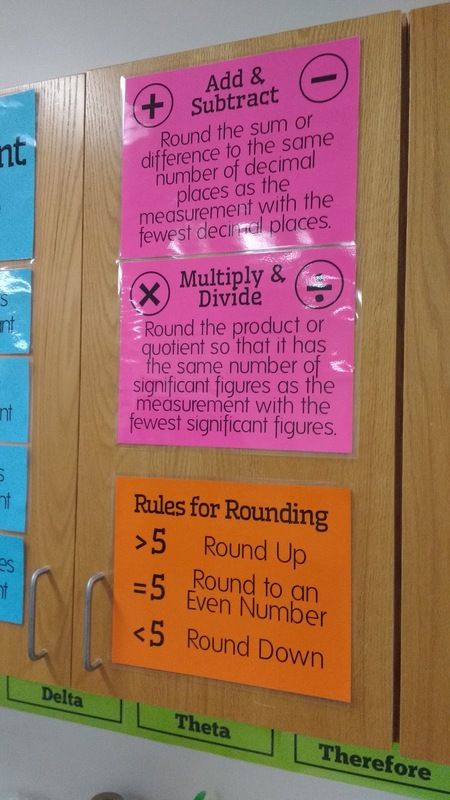 On top, I have a set of place value posters. These have come in handy way more than I thought they would this year. 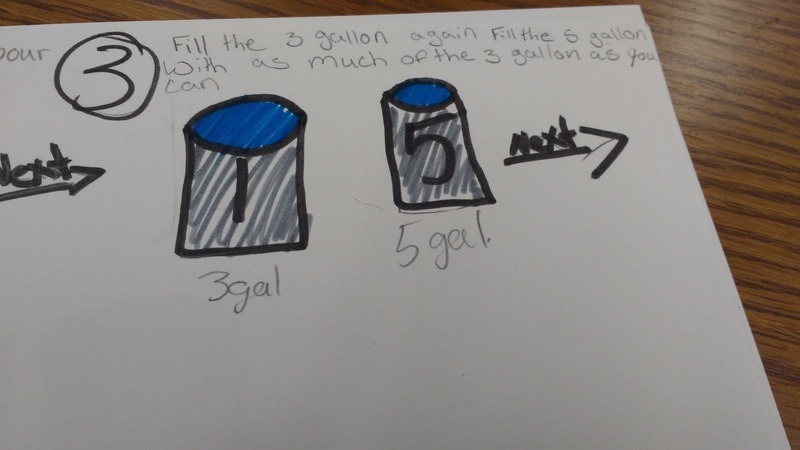 I used to think that place value was an elementary concept that my high schoolers knew by heart. Nope, they need review! I posted the files to make these posters here. 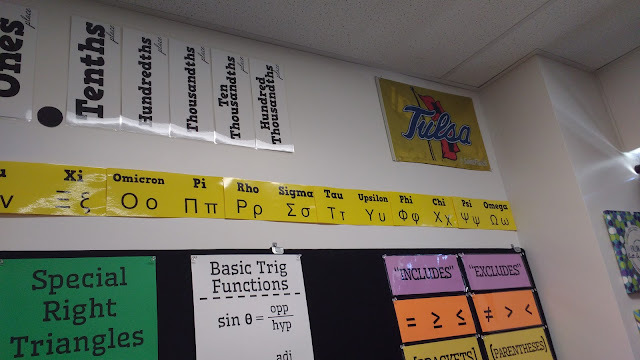 Beneath these posters, I have a set of Greek Alphabet posters that I made a few years ago when I was teaching trig for the first time. 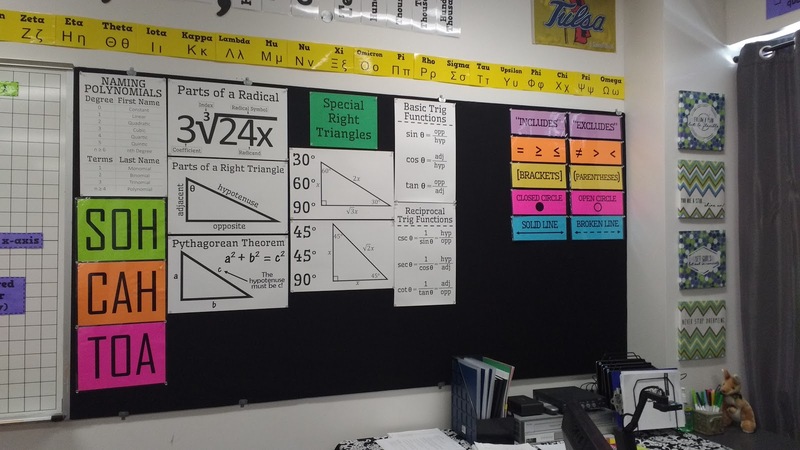 Since I'm teaching trig again this year, I've hung up my posters again. 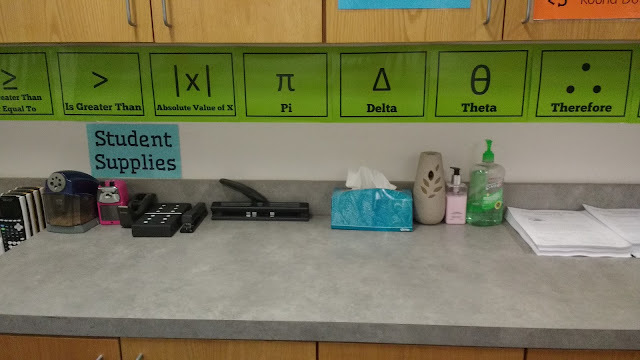 They've also come in handy in physical science this year when we talked about the different metric prefixes and look at the greek letter mu. You can find the files for these Greek Alphabet Posters here. 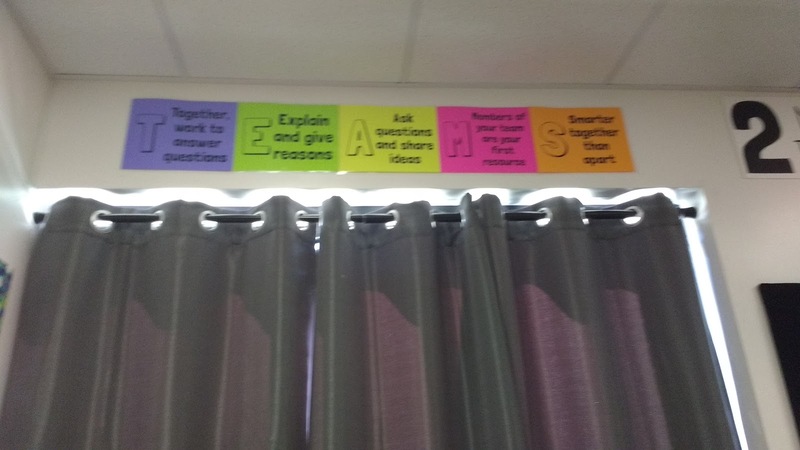 Above the window in my classroom, I hung up my TEAMS posters that I blogged about here. 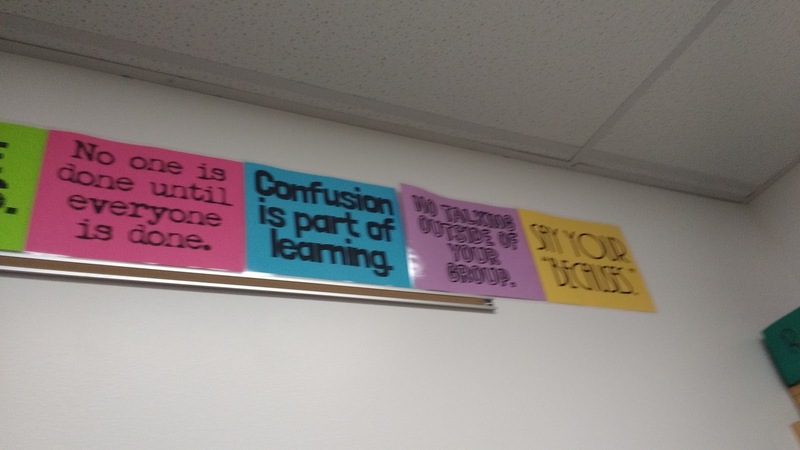 Another new addition to my classroom this year are these signs that hang over each group of tables. 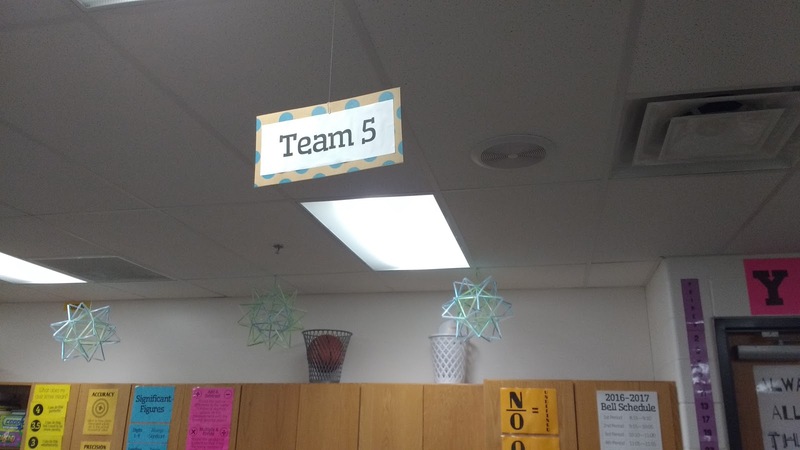 I printed the team numbers out on regular copy paper and glued them on scrapbook paper. Tired yet? We're almost done! 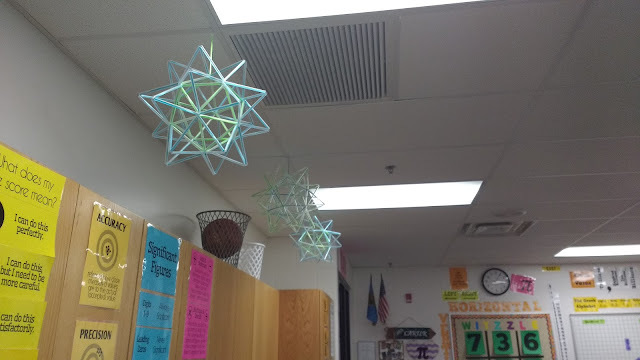 Here are the decorations I have outside my classroom door. 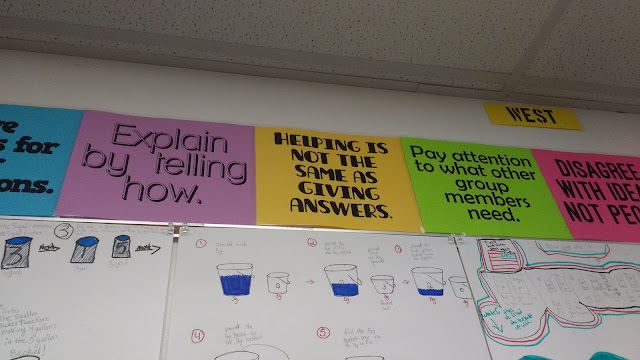 Below that, I hung my "We learn math. 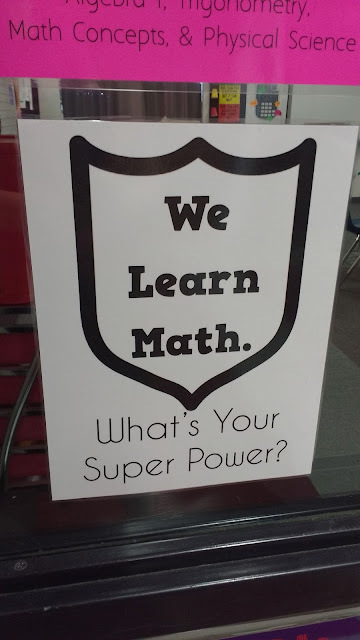 What's your super power?" poster. 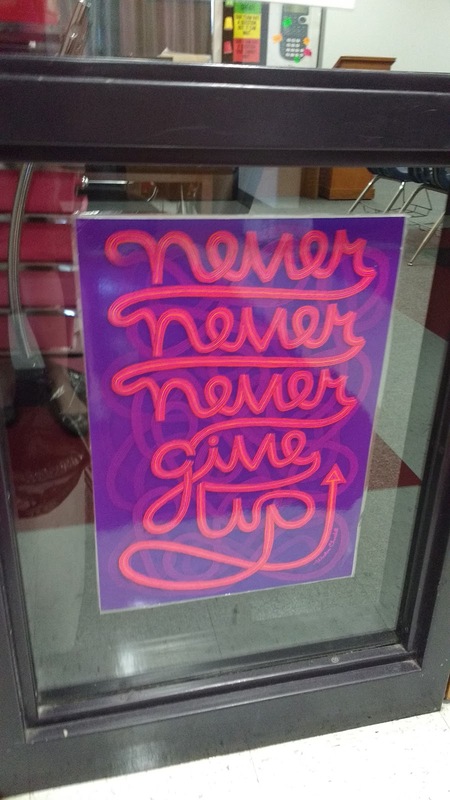 To cover up the back of my donut poster, I hunt up this Never, Never, Never Give Up poster from Scholastic. 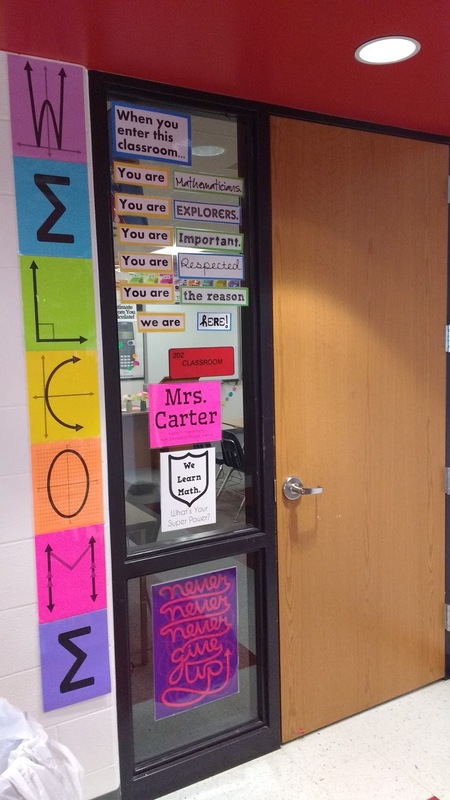 I'm especially proud of my math-y WELCOME posters. I posted the files for these posters here. And, that's it! 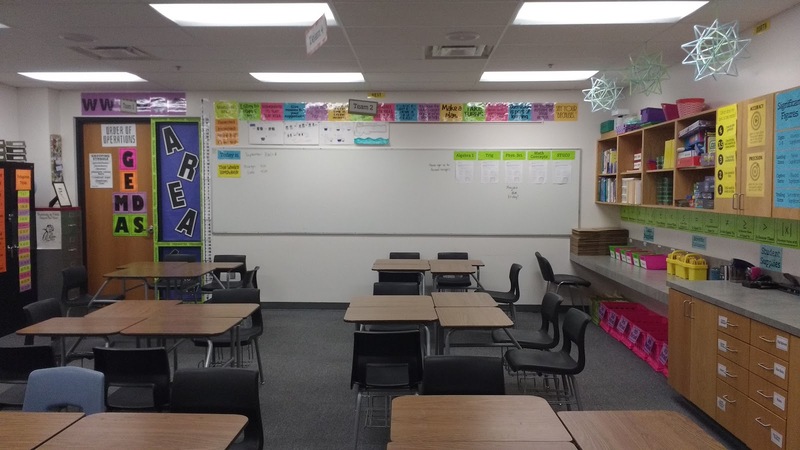 This is my 2016-2017 classroom. 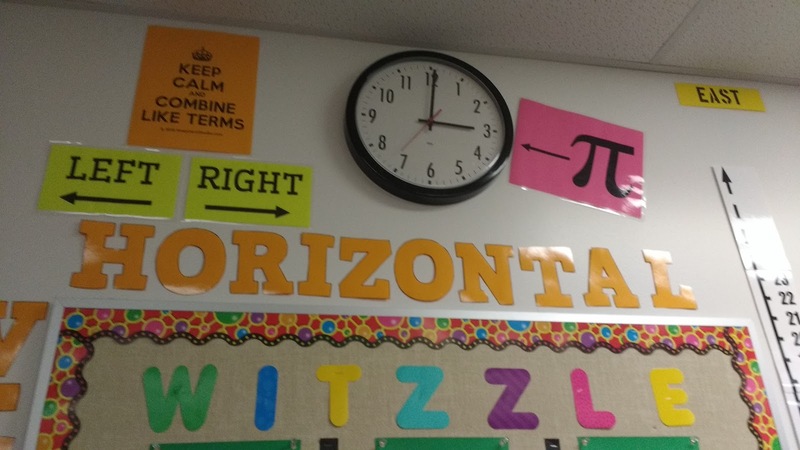 Thank you to all the MTBoS for your continual inspiration! 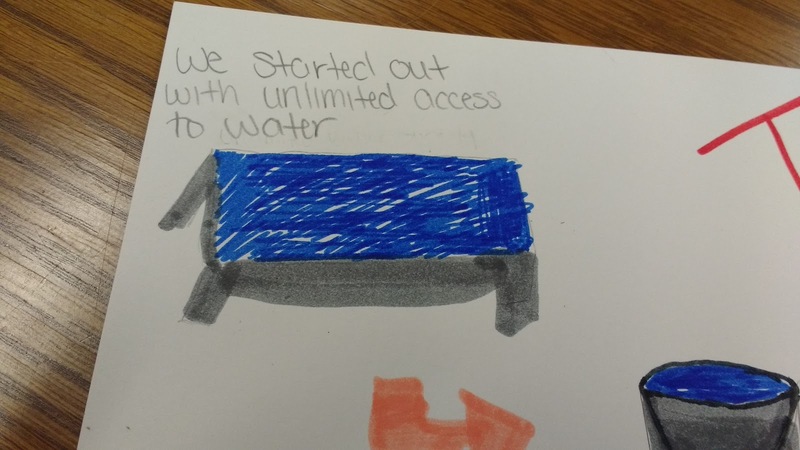 If you made it through this entire post, you definitely deserve a round of applause! 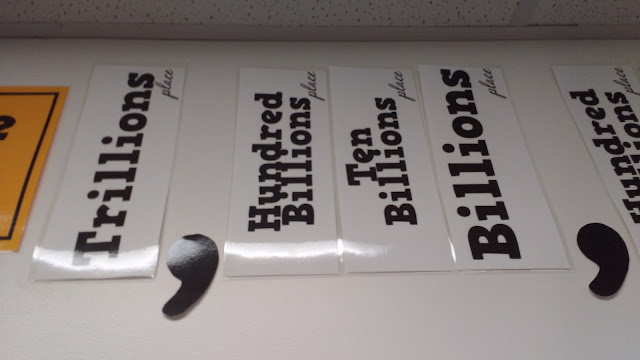 Math = Love In Print!